12.22.09 Custom House Volunteers celebrated the season with an impromptu festive lunch on Tuesday--the last day the museum opened before the holidays. 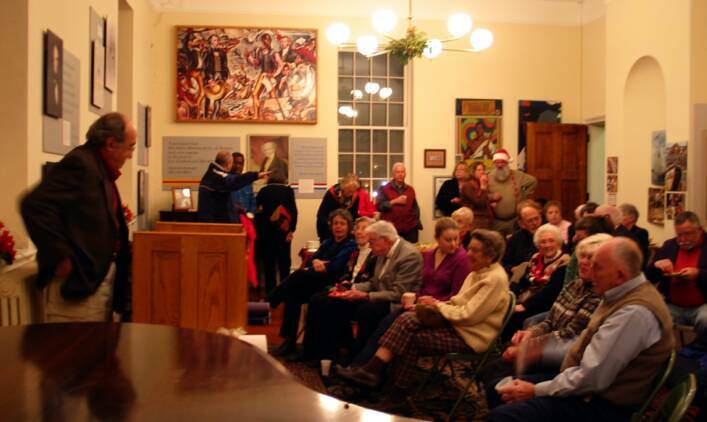 The party inaugurated the newly-named Archibald J. Chester Reading Room (formally dedicated at our Winter Celebration December 17), and you can see Archie, himself, at the far left of the group. Volunteers attending are (from Left) Archibald J. Chester, Robert Pittaway, Russ DeMarco, Pauline Demarco, William LaRoue, John Desjardins, Vinnie Belbruno, Mary Desjardins, & Kathy Gaynor. Additional photos of the group (including late arrivals Jennifer Hillhouse & George Spragg) are on the volunteer page of this Web site. 12.17.09 The New London Maritime Society held a WINTER CELEBRATION as December's Third Thursday event. 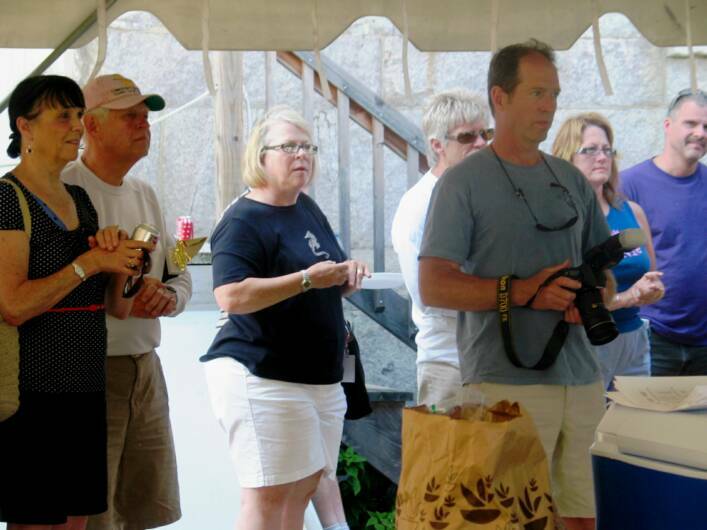 More than 50 people attended--old and new friends, presenters, volunteers, board members & donors--some returning after several years' absence. At the Custom House, we have a lot to be thankful for this year and president George Sprecace listed a few of them: roof repairs (Frank Loomis Palmer Fund grant), handicap-access ramp under construction (a grant from our fair City), the gift of New London Harbor Light (from the GSA & US Coast Guard), and the good work of NLMS treasurer/trustee & now volunteer-of-the-year Capt. John P. Desjardins (who appears on our December Home page as Santa). 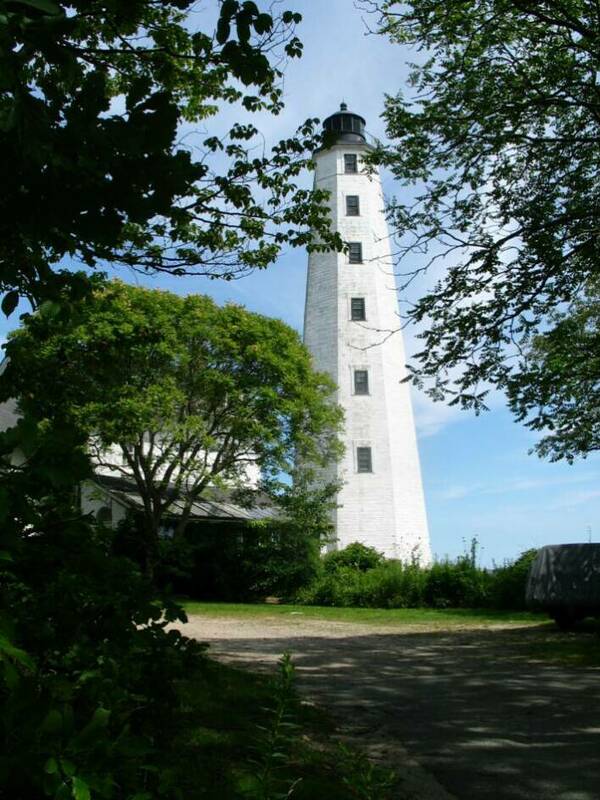 Ben Martin relayed the news of a generous gift from the Chester Kitchings Family Foundation: a grant over five years to establish a lighthouse endowment! Vinnie Belbruno oversaw the delicions refreshments!. Thank you, everyone! 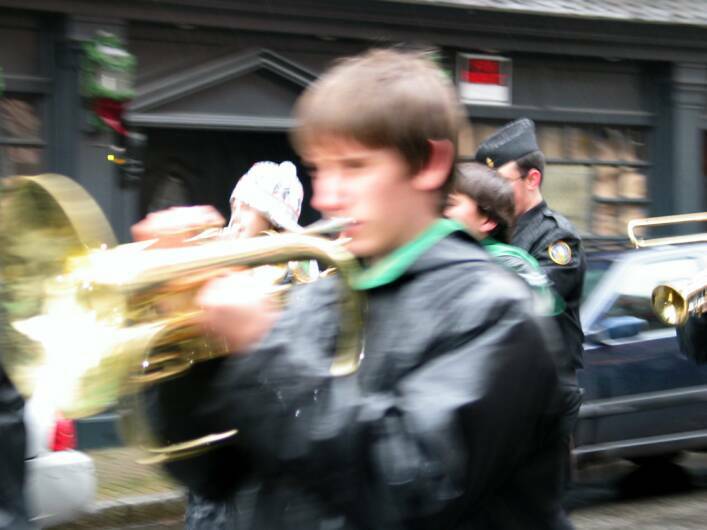 12.05.09 Saturday's New London holiday festivities began with a pooch parade & ended with a concert by the city's high school band. 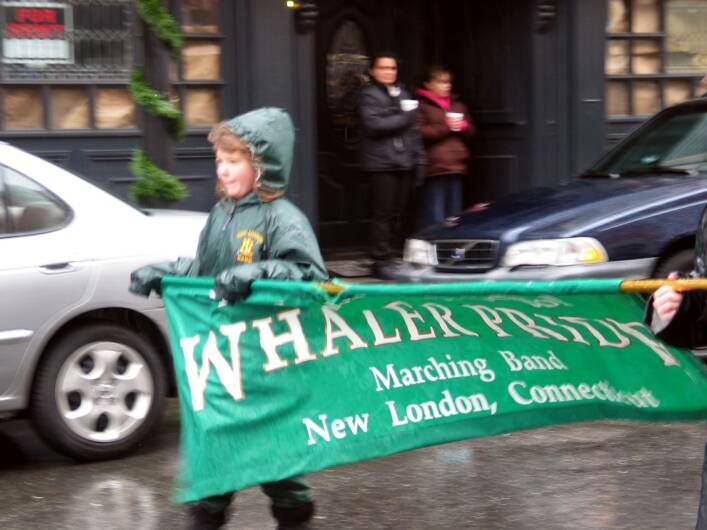 The Custom House Maritime Museum came to the rescue on this cold rainy afternoon by serving up hot chocolate and cookies after the parade. 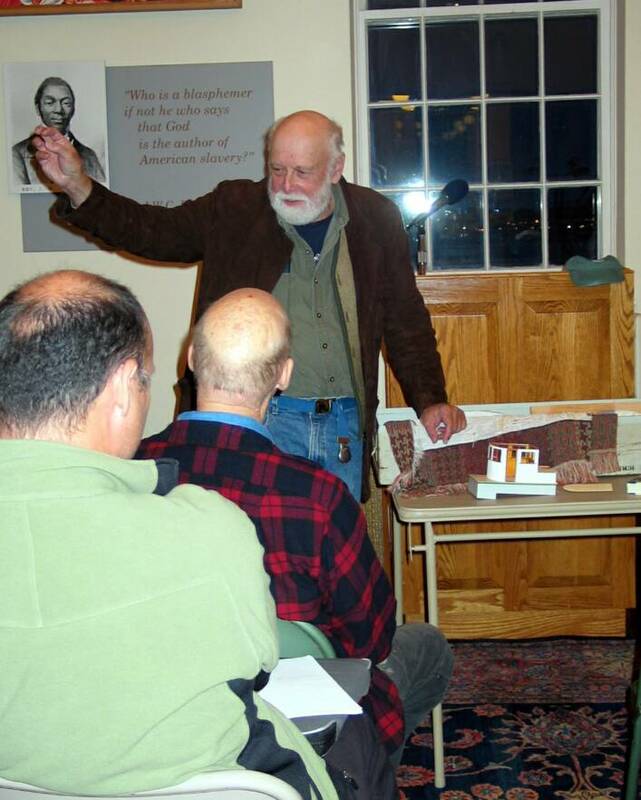 12.01.09 Stonington boat designer Rod Johnstone brought in an audience of serious yachtsmen for his First Tuesday talk on December first. 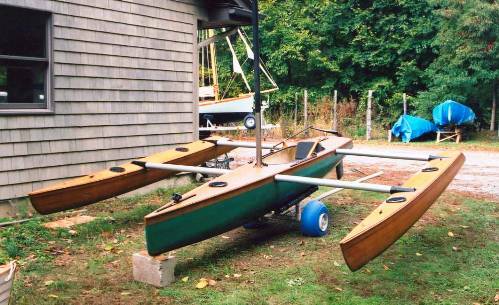 Rod spoke about his invention & development of the J/Boat. It was inspiring to hear someone talk about taking a 'new' idea for something as ancient as a sailboat, building the prototype in his garage, then having that design go on to have great success all around the world. 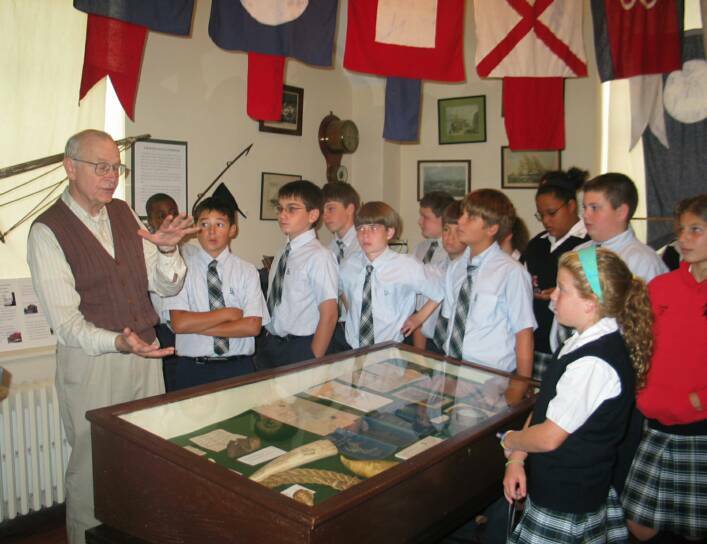 We hope to work with Rod again this summer to develop an exhibit on the boats. 11.25.09 Happy days! 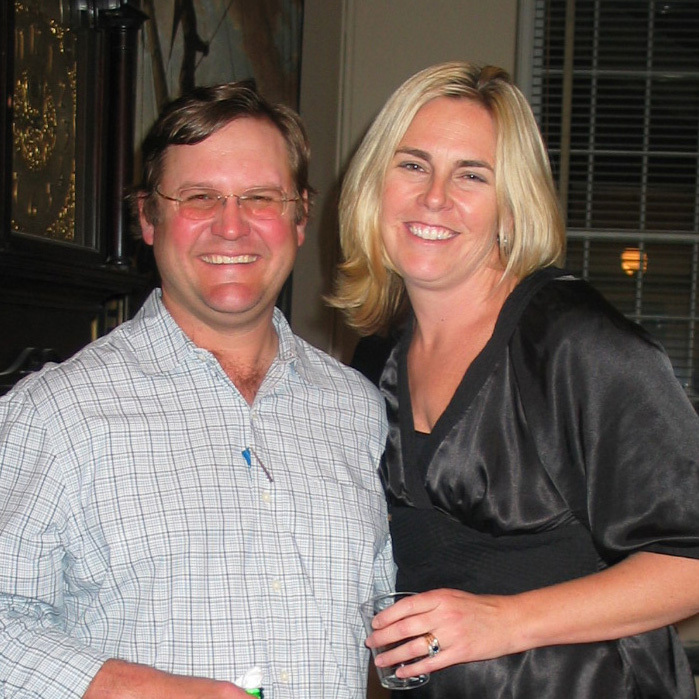 Love bloomed at the Custom House as confirmed bachelor/NLMS treasurer John Desjardins finally tied the knot! 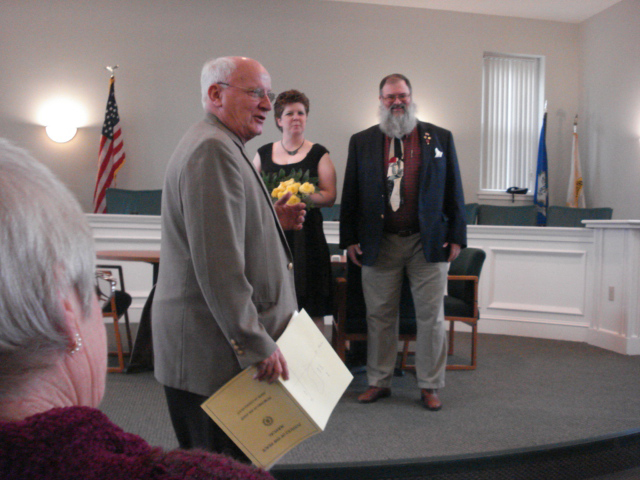 Joh married the lovely Mary Houlihan on Wednesday, November 25, at the Montville Town Hall. Officiating at the ceremony was Montville Mayor Joseph W. Jaskiewicz. 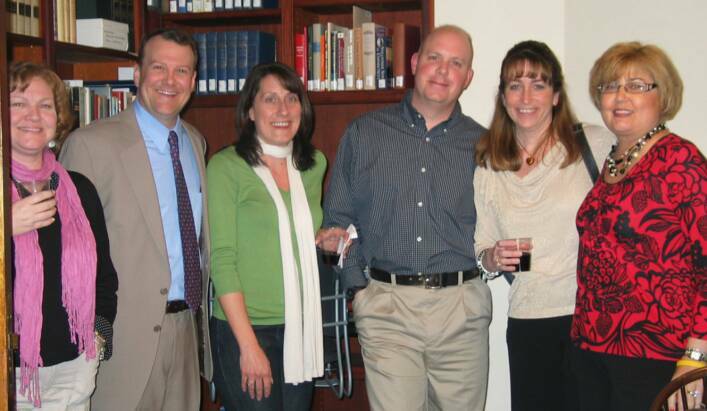 At left, John & Mary before the ceremony (shown with Bill LaRoue, Jennifer Hillhouse & Ruth Nagle). 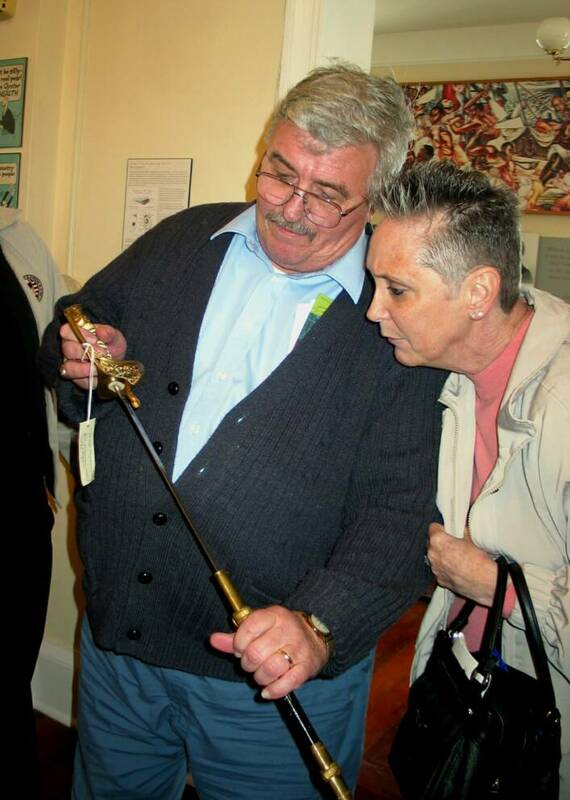 Among thoes in attendance from the museum were super volunteers Jennifer Hillhouse & William LaRoue. More photos to come once the happy couple returns from their honeymoon. began with Penny Parsekian telling the background to an oyster song performed by her husband, Geoff Kaufman. And although our sound system was a shade less-than-perfect...Penny was un-deterred. Well, we're not surprised: 1.) the oyster exhibition is based in large measure on Penny's charming, fact-filled book, The Awesome Oyster, which was published in 1996 by Mystic Seaport, and 2.) because Penny, herself, is awesome! 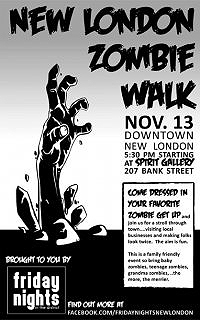 11.13.09 Friday the 13th we stayed open until 8 PM to welcome participants in New London's first ever ZOMBIE WALK, along with other, less-terrifying, holiday shoppers. 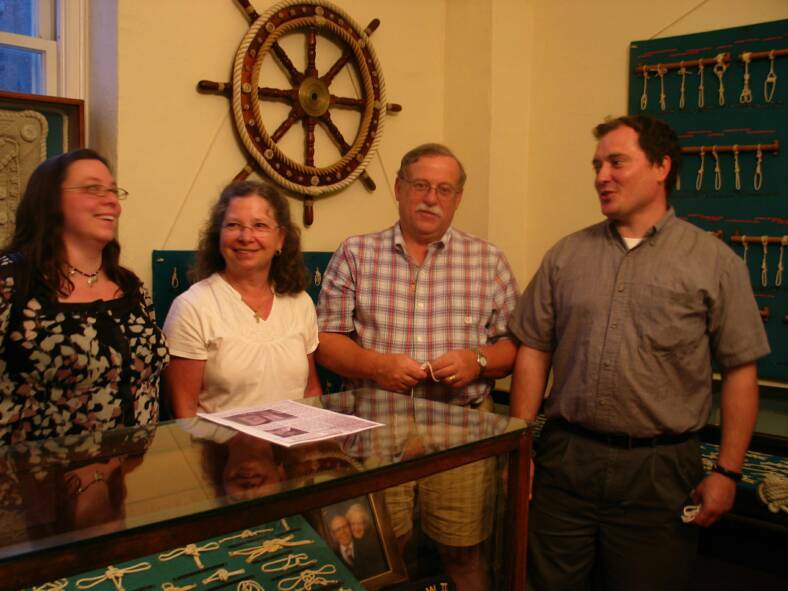 The Custom House Maritime Museum is happy to join with an array of New London downtown businesses to promote New London as a shopping destination & to make a special offer: for the next several Fridays leading up to Christmas, the Custom House Maritime Museum will be open Fridays from 6 to 8 PM free of charge! 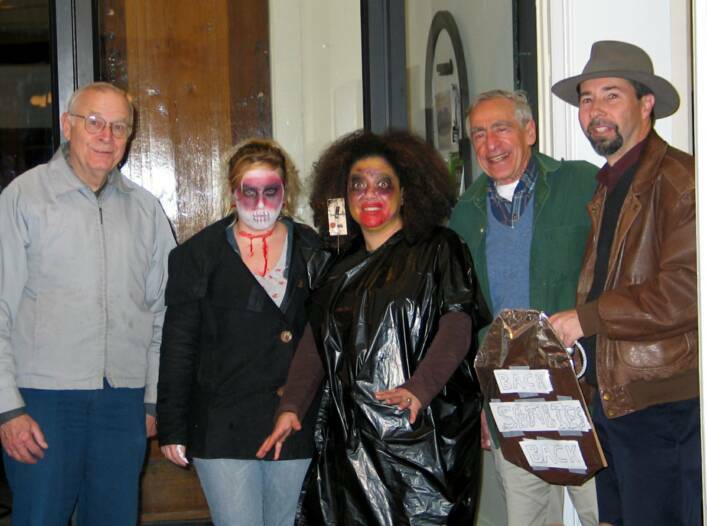 And YES, that is Zombie/Flavours of Life/Marcie Boyer with a mouse trap in her hair standing beside New London City Planner Harry Smith, who came prepared to defend us with a special, shiny, anti-Zombie defense shield. Thanks to Harry, all remained safe & the evening ended well. 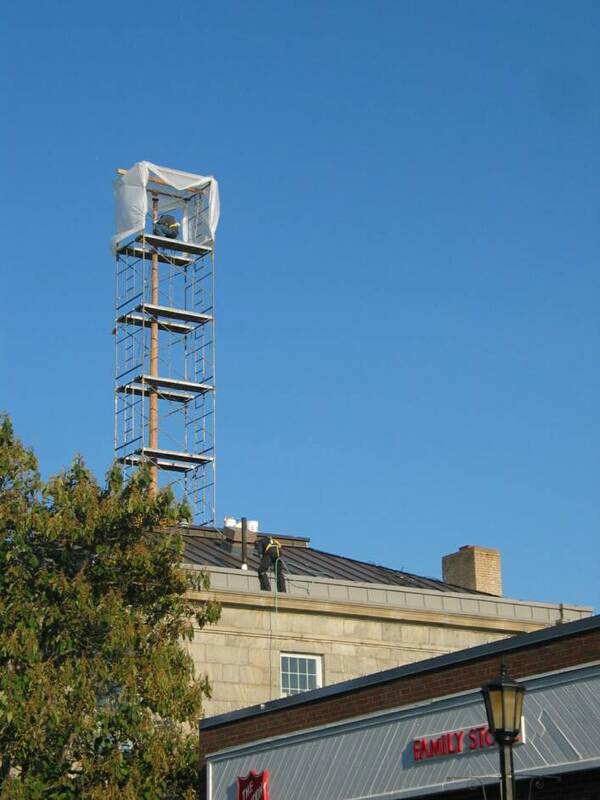 11.09.09 Work is ongoing on the Custom House roof. 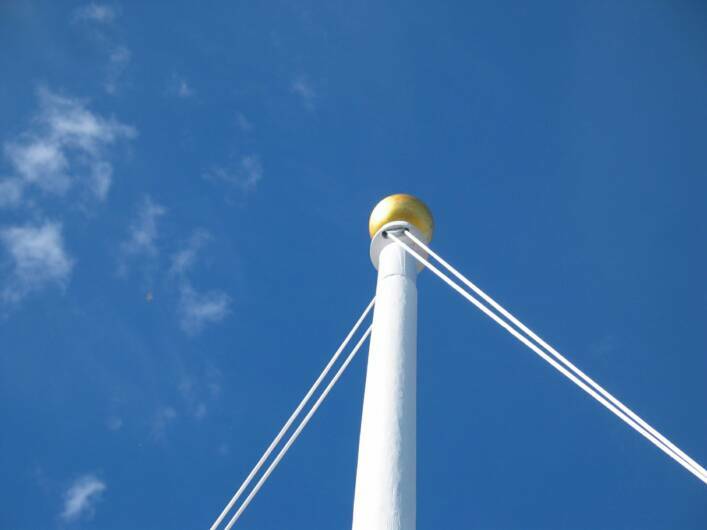 Most recently, Patricio Montenegro and Paul McSweeney have restored the tall, mast-like flagpole atop the museum, scraping & sealing all the cracks, repainting the pole & guilding the finial. writer/reconteur & New London native Ellery Thompson. 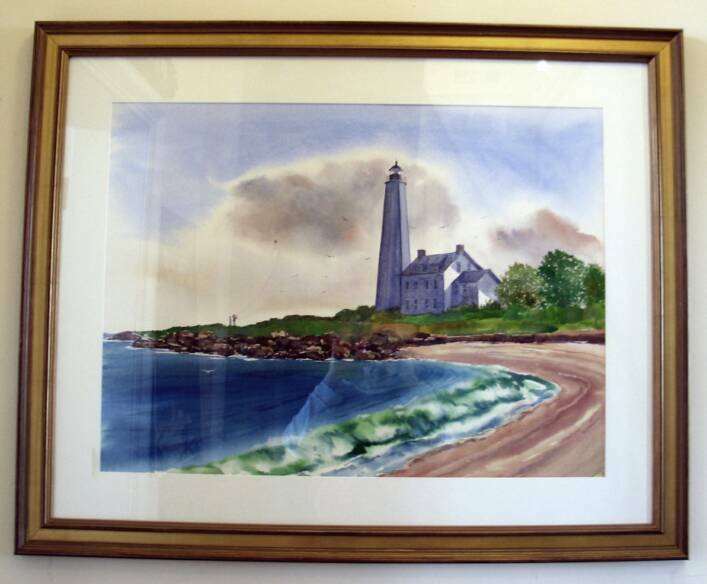 New London artist Bob Hauschild donated a watercolor of New London Harbor Light, which now hangs in the museum lobby. Thank you, Will & Bob. And an addded thank you once again to retired Electric Boat engineer & museum trustee Bob Stewart, who invited NLMS library volunteer Brian Rogers to review his library, with the result Brian selected more than 200 voilumes on ships and model making, all of which have been added to the Frank McGuire Library. 10.30.09 If you've been wondering about progress in the museum's Lower Level--everything is progressing nicely, thank you! The Montesi models-- including an adorable depiction of the Thames Tow Boat Company's Miles Standish (far left)--have been installed. We'd like to thank the Montesi family, Lyman Allyn Museum, and Aaron Rogovin for all their help in making this year-long installation possible. 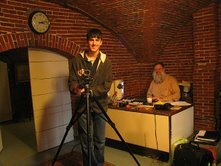 Super Sunday volunteer Ivan Metzger is shown (to the immediate left ) with one of the new models. 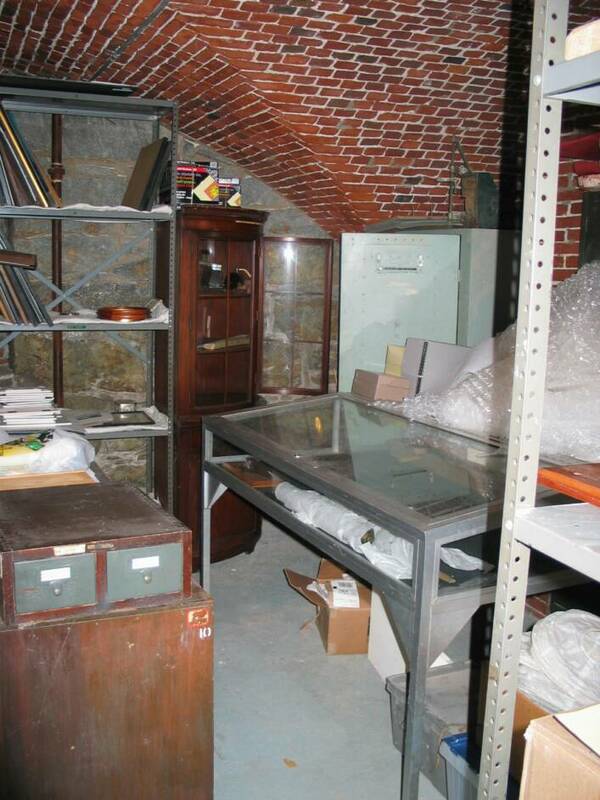 And for our collections room: less than one year ago, the place was a disaster. But with the help of many volunteers, the room was emptied, cleaned & painted, and reorganized with a splendid group of oak collection cases donated from the Yale University Art Gallery. Although the room looked fabulous in it's pristine, empty state, it now looks even better as our collections have slowly been moved into place. 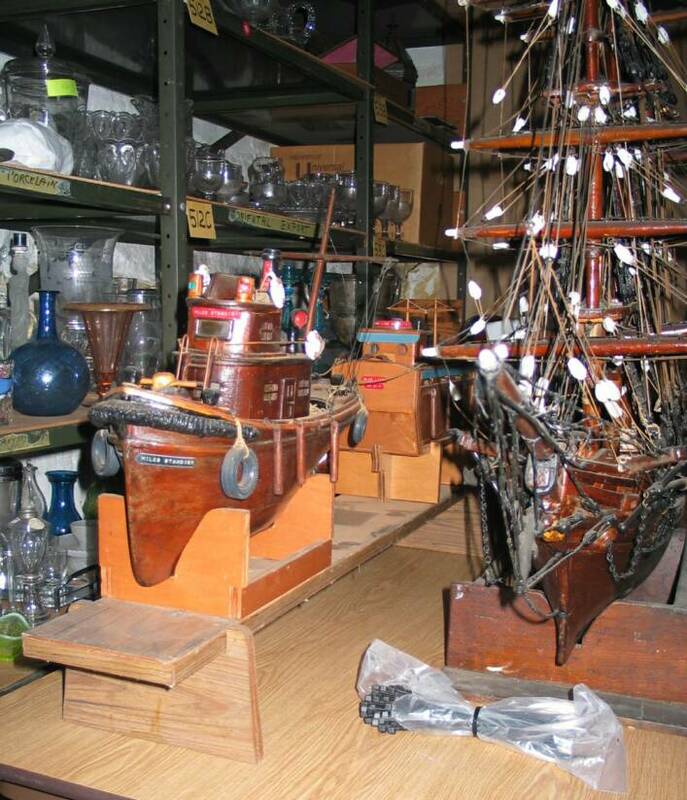 This transformation has been ably guided by museum trustee and Mystic Seaport curator/archivist Fred Calabretta. 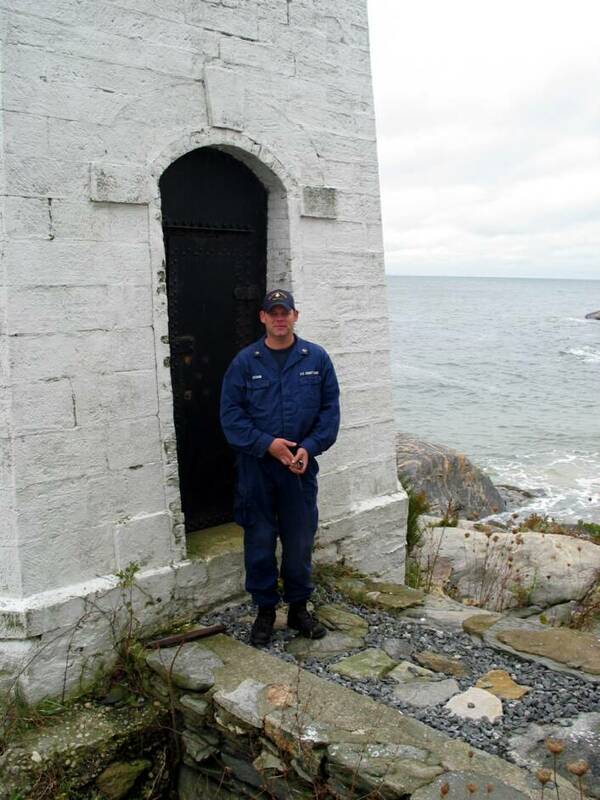 10.16.09 The next step in taking ownership of New London Harbor Light took place when the Coast Guard opened the lighthouse door for us and the new grantee--Benjamin Martin-- changed out the lock. 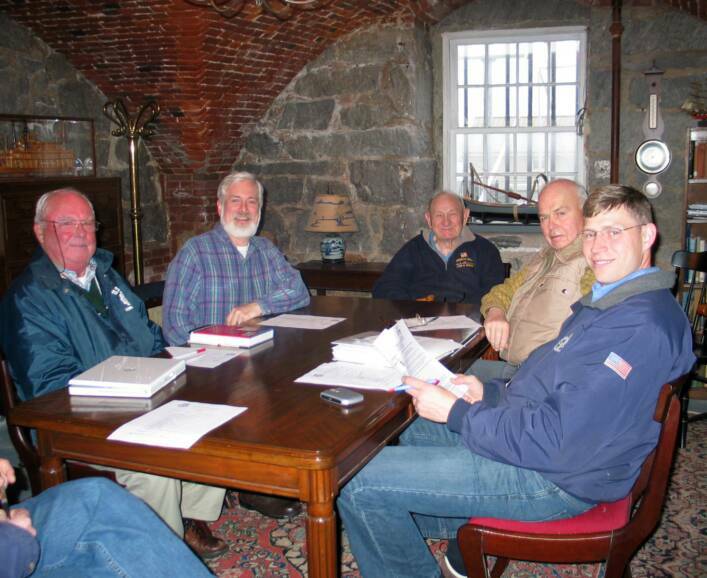 Lighthouse tender Brian Gresham met with New London Maritime Society's past president Ben Martin on a cold, wet, Friday morning. 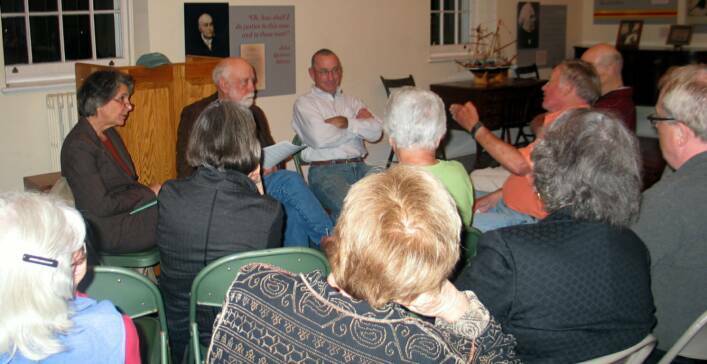 10.15.09 October's Third Thursday program had Captain Robert Dinsmore (shown far left) giving a terrific talk about the rise and fall of Lightships--& particularly about the lightships that had been stationed from Connecticut to Boston. 10.11.09 We're in The Day, again, today defending our custom house as the "oldest and prettiest"--which it is! 10.8.09 Do we look happy (see left)? In fact, we were! 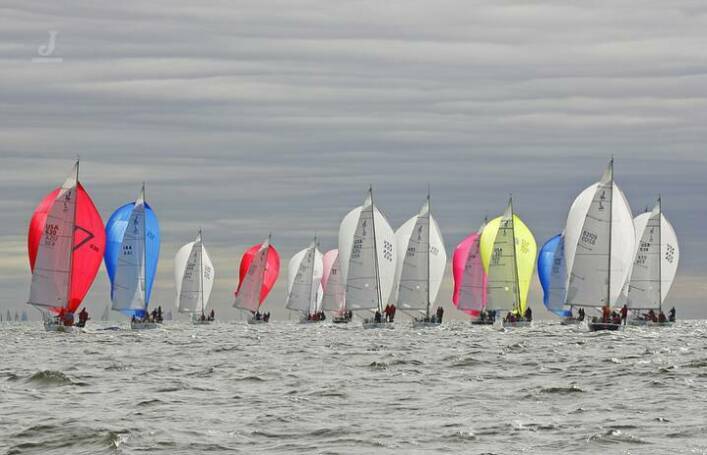 But we also were aware of the great responsibility the New London Maritime Society took on thisThursday afternoon, October 8, when we assumed ownership of the New London Harbor Light. 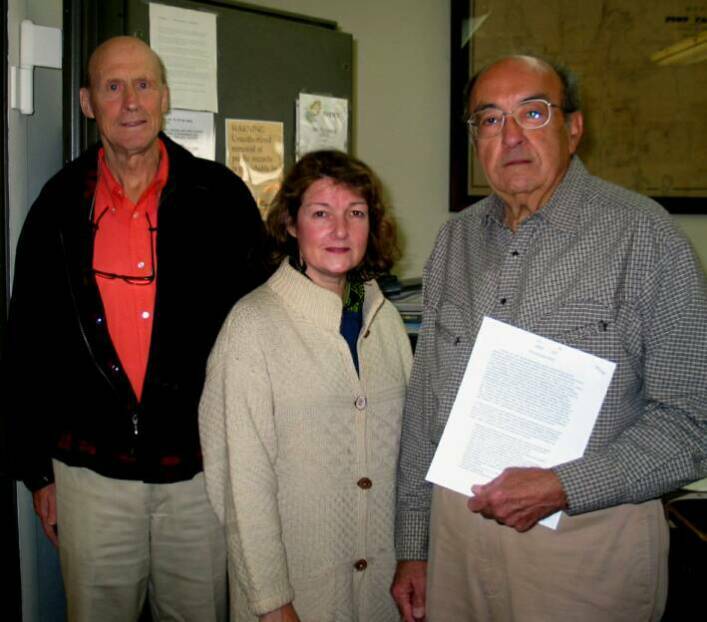 Founding member Rob Pittaway, director Susan Tamulevich and board president Dr. George Sprecace are shown in New London CIty Hall filing the deed to the Lighthouse. Read about it in The Day. 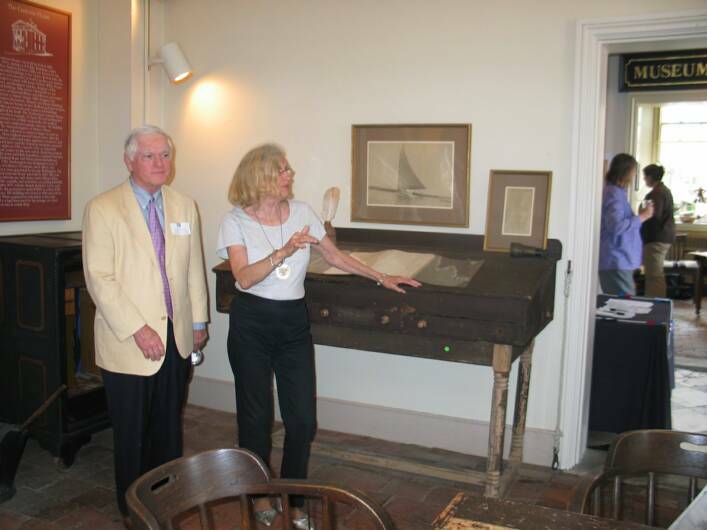 10.8.09 Board president Dr. George Sprecace (shown left with Montesi-granddaughter Elvira Carboni) visited curatorial assistant Barbara Laux at the Lyman Allyn Art Museum to view a collection of ship models made by Mr. Montesi of Norwich. These intricate models will go on display in our new ship model gallery (in the museum's lower level), scheduled to open next month. 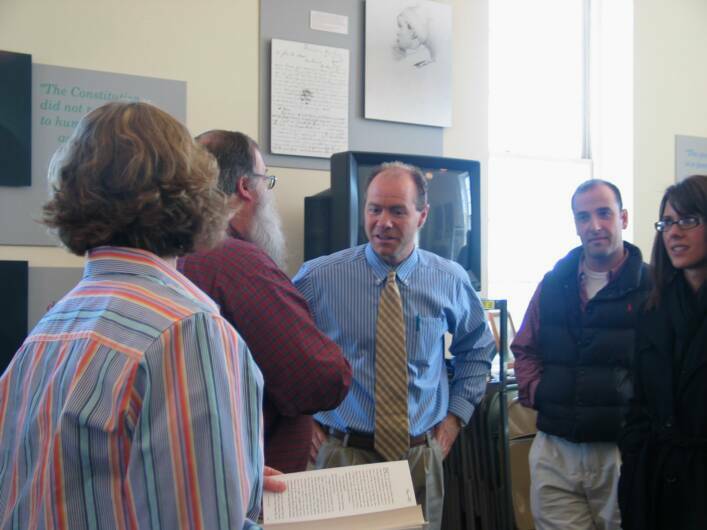 10.8.09 The day began with a meeting with members of the Shellfish Commission and Noank's Aquaculture Coop. We will be working together over the next months to bring attention to area oyster farmers' concerns. Watch our Web site for updates and information about how you can help. 10.8.09 Captain Heidenreich, a New London Maritime Society founder now living in North Carolina, returned to the Custom House Thursday afternoon with other former members of the Coast Guard. 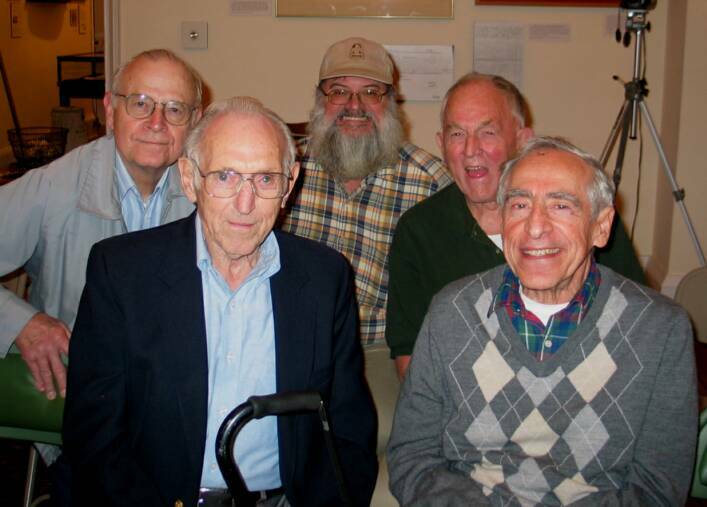 They'd gathered in New London to celebrate their class's 50th reunion! 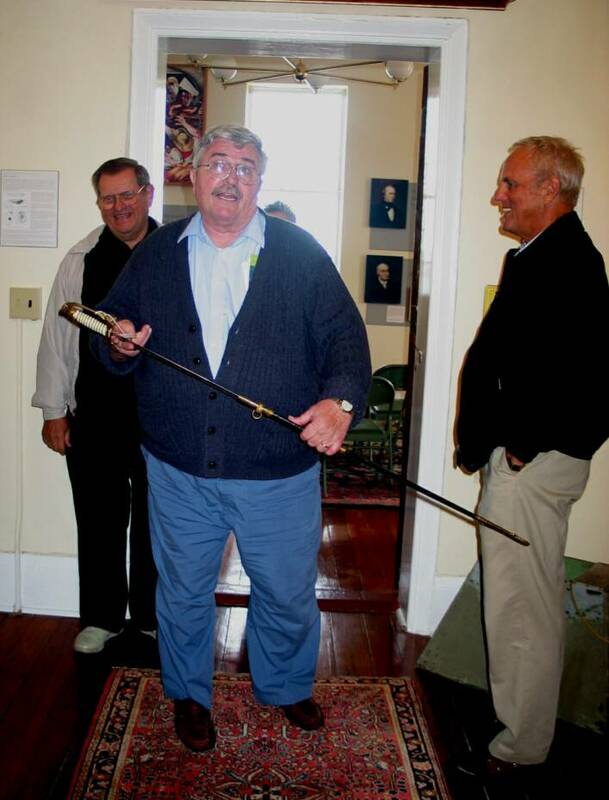 Captain Heidenreich was very happy to be reunited with his sword, which had been used at the museum's grand opening to cerimoniously cut the cake. He was delighted to hear that the sword has been used to cut cake at every special event we've held for the 26 years since! 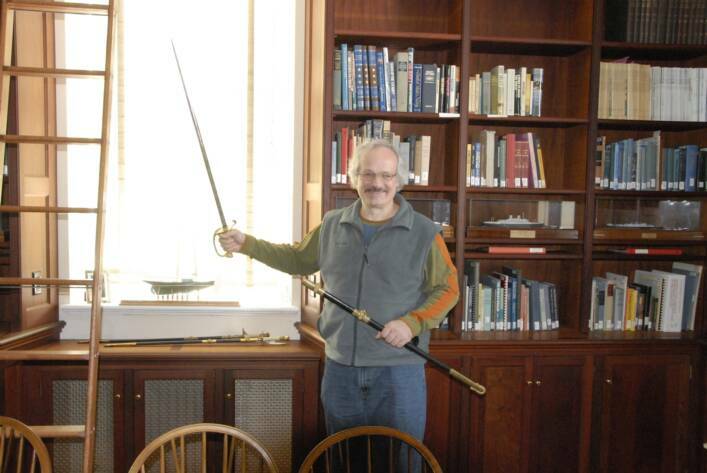 The Heidenrich sword is kept in our library and a magnificent piece of scrimshaw, donated by the Captain last year in honor of the Society's 25th anniversary, currently is on display in the Jibboom exhibition. 10.6.09 Steve Jones told tales of the Anne (pronounced Ann-ie) and New London Oysterman Captain Larry Malloy at Tuesday night's Heritage Workshop. Steve's book about Captain Malloy Working Thin Waters, listed by The Boston Globe as one of the eight best books of the year, is available in our museum shop. 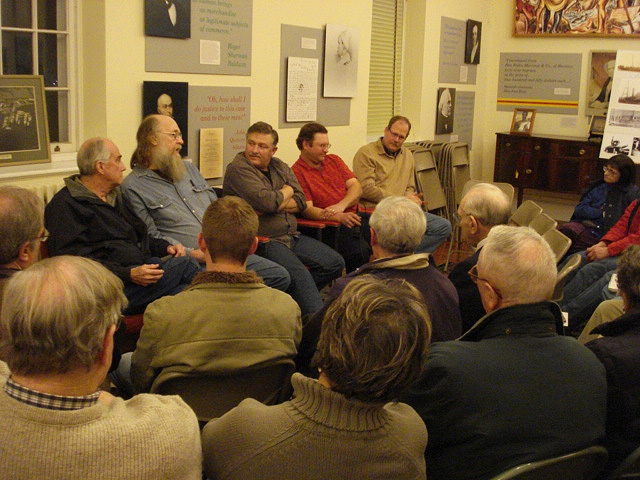 In Tuesday night's audience was our History Club: Harry Nielson, Russ Demarco, Bill LaRoue, John Desjardins, & Archie Chester. 9.25.09 How great to be visited by the real thing! 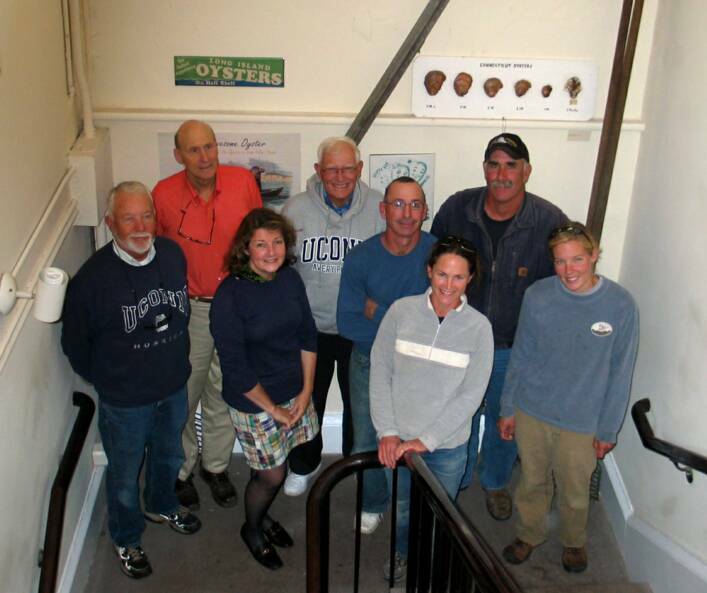 On Friday, we were pleasantly surprised to have the Noank's Mystic Oysters farmers come see The Awesome Oyster exhibition. 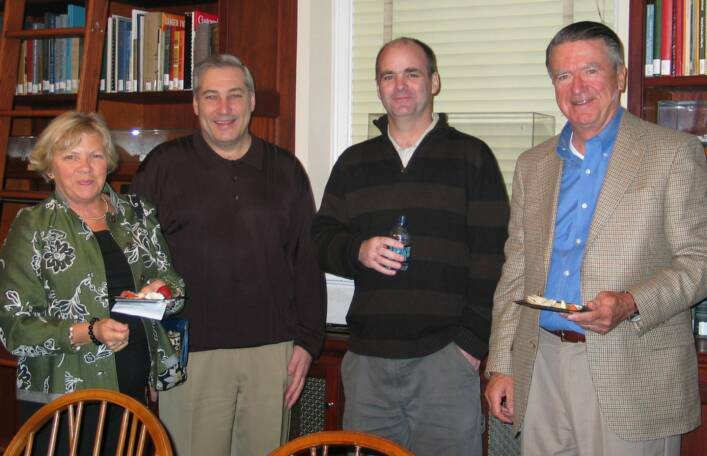 From left are Eric Muller, Kate Blacker, Jim Markow, and Karen Rivara. 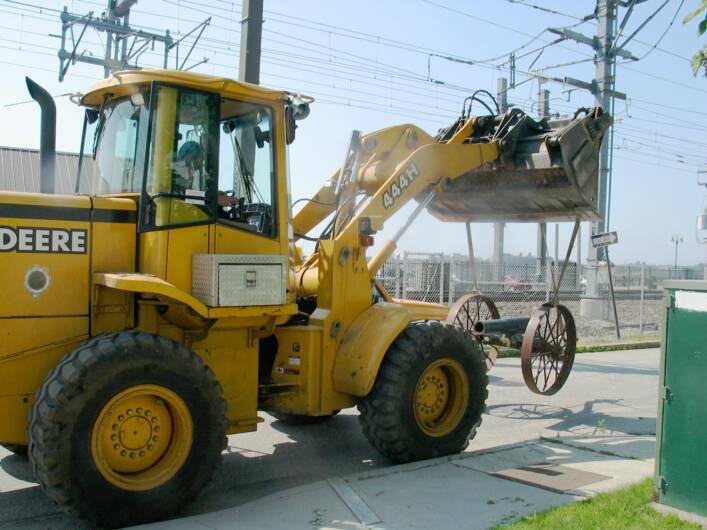 9.23 09 Long-time super volunteer Rob Pittaway tackles project after project at the Custom House. When the museum first opened 26 years ago, he helped strip layers of linoleum off the floors. He went on to make the knotted ropes for the doorways. 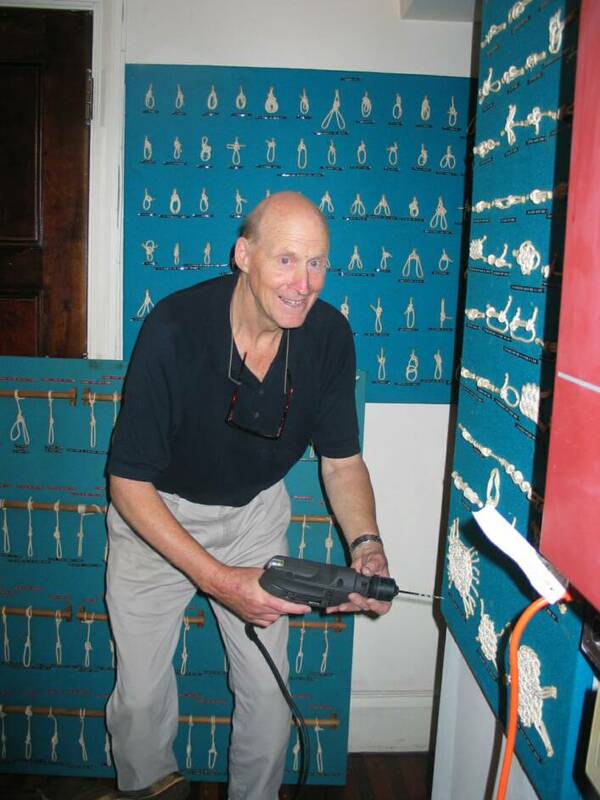 Now Rob is back again working with rope: shown at left, he is reinstalling Alton C. Beaudoin's encyclopedic knot boards from the summer's special exhibition, Knots & Fancy Ropework: Alton C. Beaudoin - Master of Knots, to virtually wallpaper an alcove on the museum's main floor. Thank you Matt Beaudoin (the master knotter's grandson) for the loan of these marvelous boards. 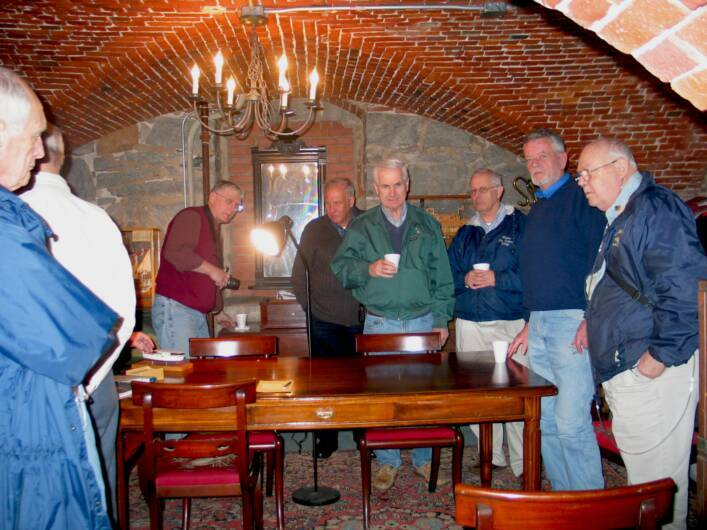 9.19.09 The Ancient Order of Hibernians met at the museum on Saturday to reflect on the 1985 visit of the Irish Training ship, Asgard II, to New London; look at the life of Irish-born Commodore John Barry, Father of the US Navy, and remember Robert Emmet, who in 1803 was hanged and decapitated in public view for physically objecting to the 1800 Act of Union, which forced Ireland to be totally ruled by England.. 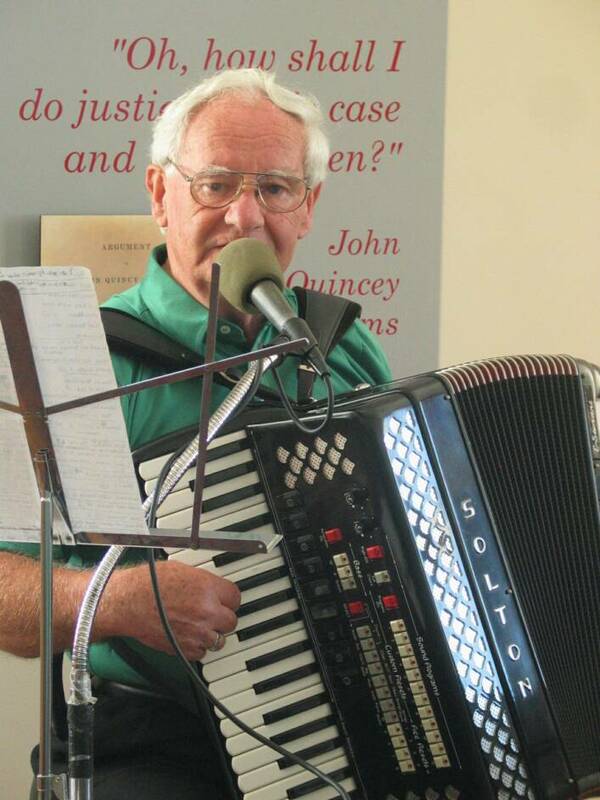 The Halfway to St. Patrick's Day celebration also brought music to the Custom House--both lively accordion tunes and stirring ballads. 9.19.09 September's Third Thursday was All About Oysters with a round table of three experts in the field: Penny Parsekian, whose book The Awesome Oyster, inspired our new exhibition; Steve Jones, an author & mariner who has been involved with aquaculture development in the region for many years; and Steve Plant, a Noank oyster farmer who was instrumental in helping us bring together the exhibition. 9.17.09 We have received four impromptu contributions to the Awesome Oyster exhibition: Pine Point School loaned us 20' oyster tongs and a shellfish dredge; Donald Bell, of Trumbull, loaned a wide variety of oyster cans, tools, posters, shucker's tokens, etc..., from his extraordinary collection of objects d'oyster; our new best friend Steve Jones, added to his many contributions so far to the exhibit by bringing a wonderful oyster basket emblazoned with a big M--from Captain Malloy's famous oyster boat the Anne (pronounced An-nie). ; and J.D. Diaz-Saavedra brought by two lovely little oyster tins, which we added to the dining section of the exhibition. 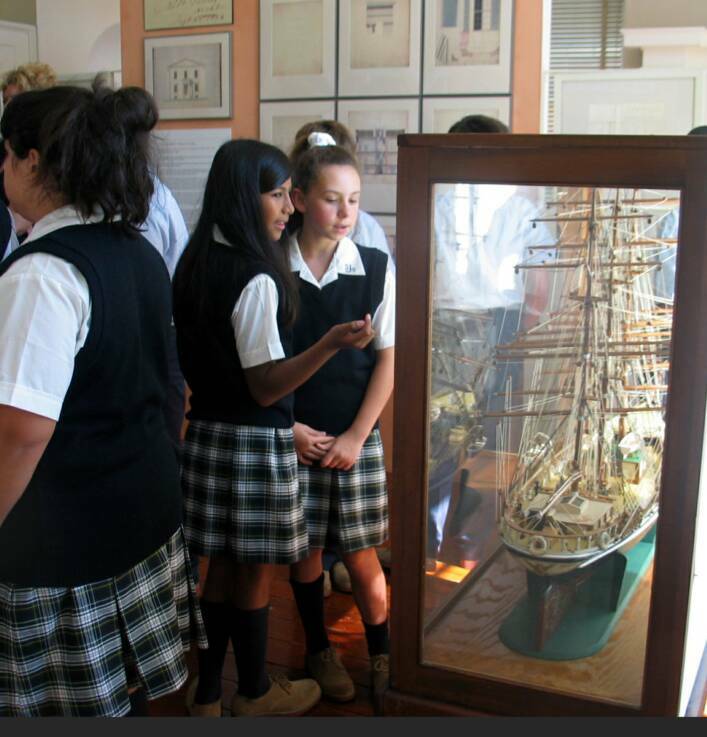 9.14.09 Another great school visit: this Monday the 6th grade from St. Joseph's Home School toured the museum with head docent Bill LaRoue, learned about the Amistad incident, & then made their own model of the Amistad ship. The surprise is that the class arrived at the Custom House in a pair of white limosines! Turns out, the transportation was donated. 9. 10.09 We met Norman Bliss last December, when he portrayed a Jibboom Club member in a Flock Theatre performance at the Custom House. 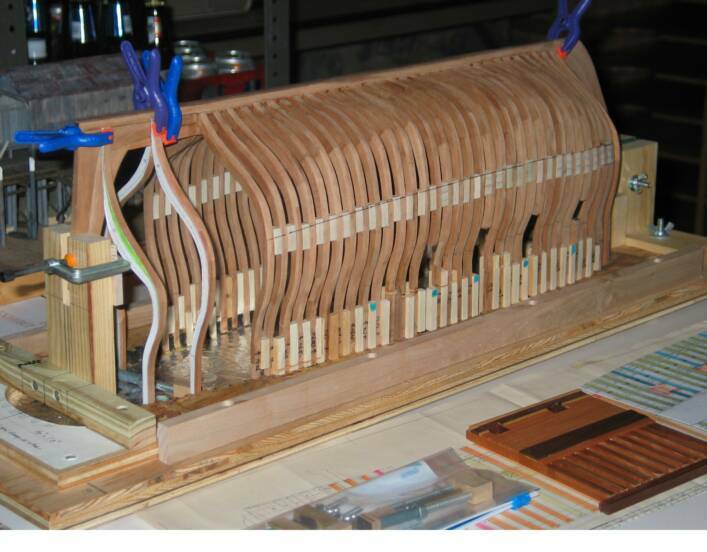 Norman is related to the Bliss family of marine instument makers--the 2nd-oldest instrument makers in the country--and because of his interrest in the subject he has become the museum's own curator of marine instruments. 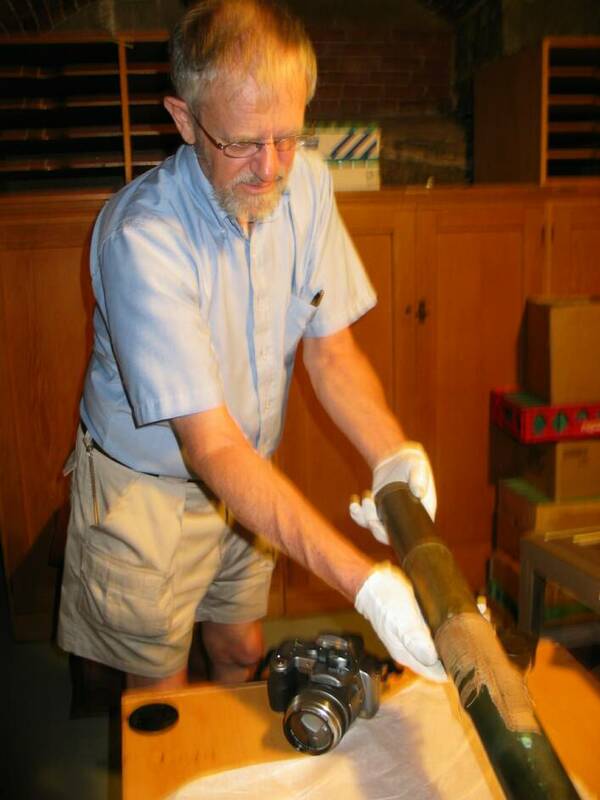 This week, Norman gave us a report on the onjects in the Custom House collection. That information soon will be posted on this Web site. With luck, Norman will turn that research into a special exhibition. 9.01.09 Read our SUMMER 2009 Newsletter! 8. 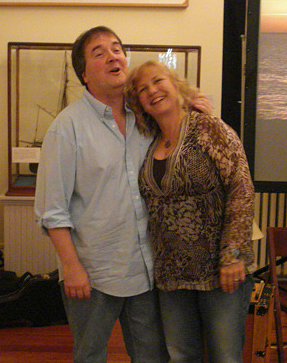 30.09 Musician John Mock, shown far left with his wife, returned to his home territory from Nashville with a Sunday afternoon concert at the Custom House. 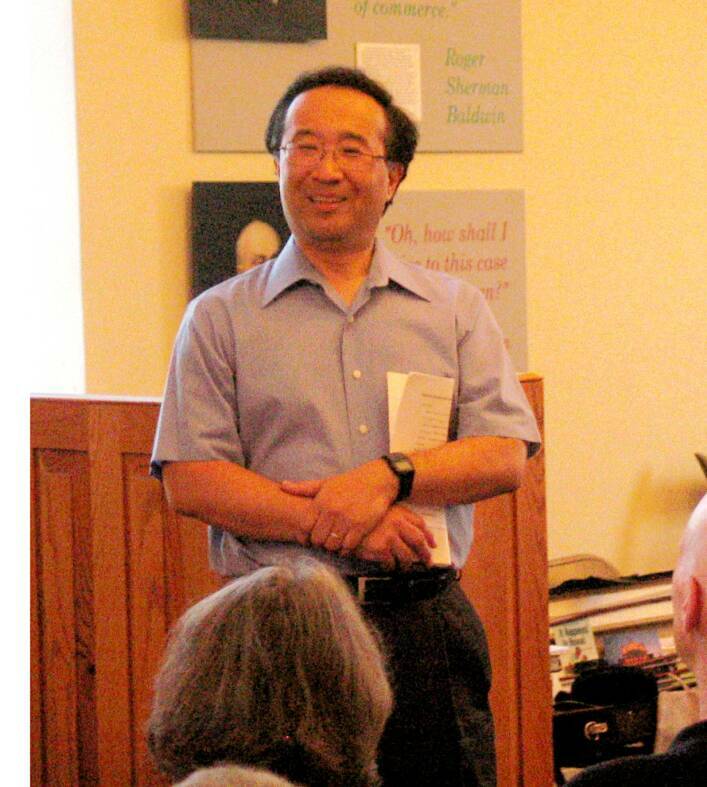 A members-appreciation event, John sang, played the guitar & concertina, and showed photographs of his travels. 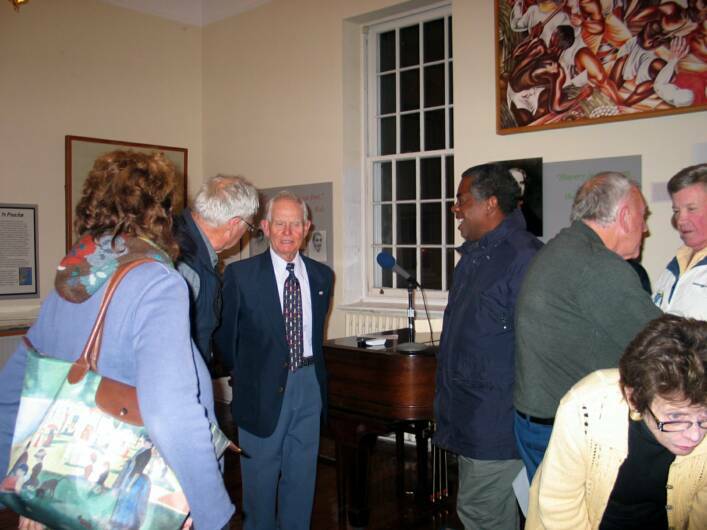 John then generously donated all proceeds from the sale of his CD to the museum. The CD still is available in our museum shop. 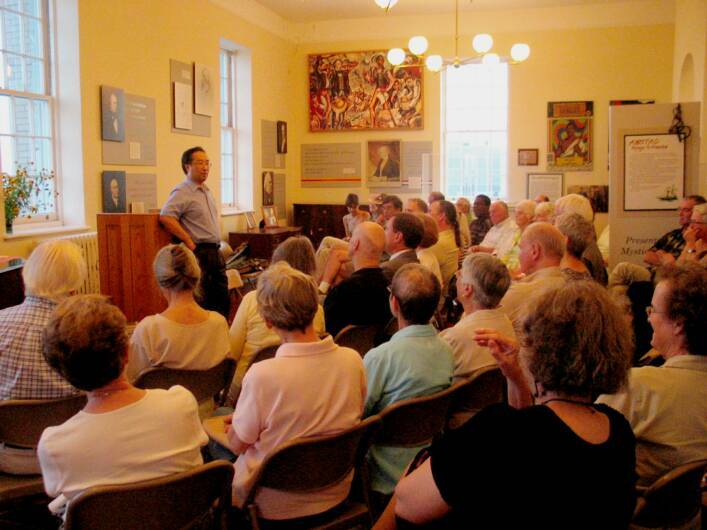 8.20.09 Toshi Plays New London: A New Season for the Eastern Connecticut Symphony Orchestra., a Third Thursday Jibboom Roundtable, brought in Toshiyuki (Toshi) Shimada, who recently was selected as the fifth music director of the Eastern Connecticut Symphony Orchestra, to present an inside look at his career, his vision for the ECSO, and the upcoming season. Stephan Tieszen, ECSO Concertmaster, accompanied Toshi. 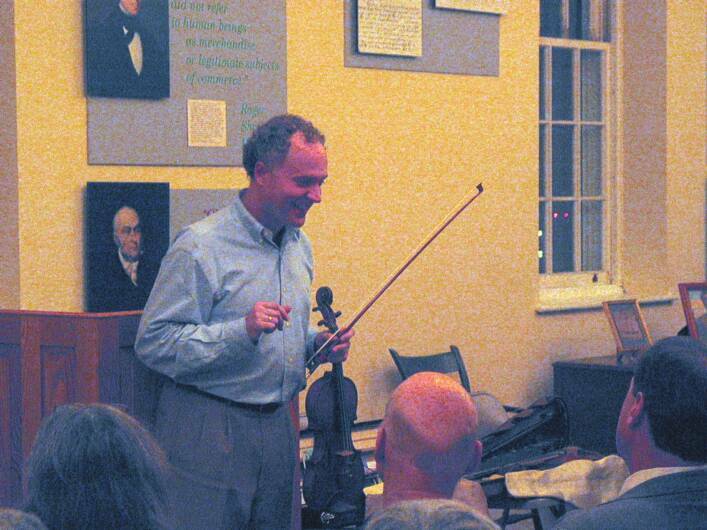 Stefan brought along his 18th-century violin and several voilin bows, which he used to demonstrate how the sound of the vioilin--and the design of the bow--has changed to reflect evolving music tastes. Attendance for the program topped fifty--many of whom were new to the museum, which bodes well for future music programs at the Custom House. Let's hope this was the first of many to come. We'd like to especially thank Isabelle Singer, the executive director of the Symphony, for making this program possible. 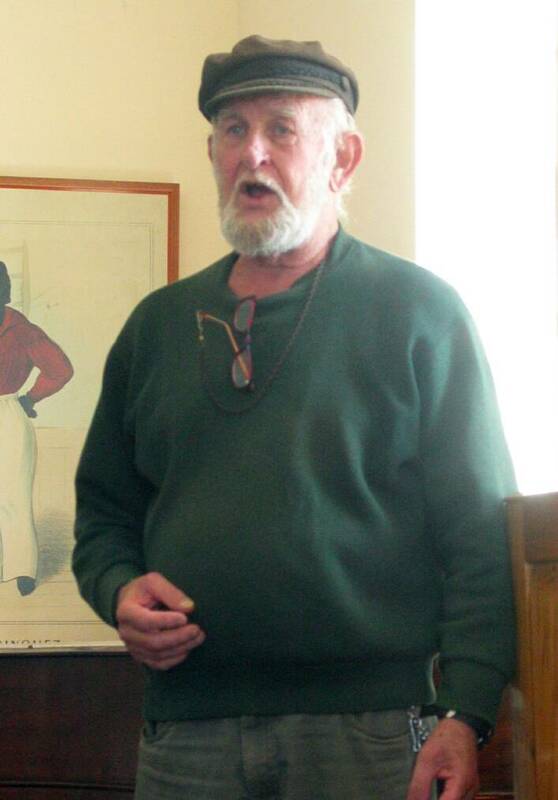 8.18.09 Steven Basil of Old Lyme has run charter boats out of New London, Groton and Old Saybrook for forty years. 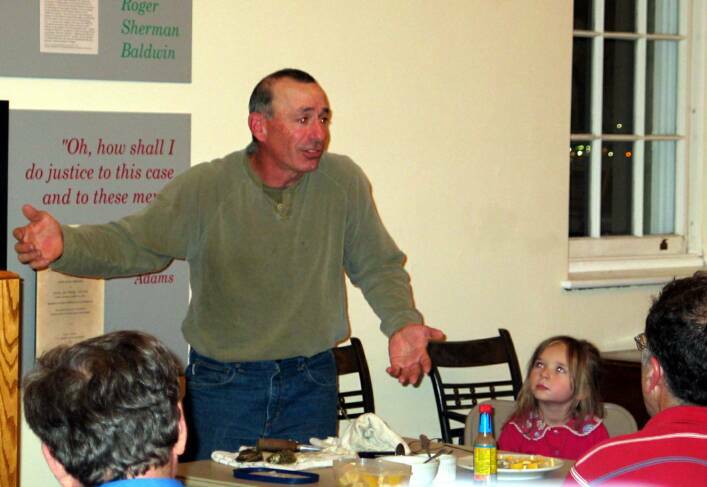 A natural storyteller, he gave a rollicking account of his experiences at Tuesday's Heritage Workshop. 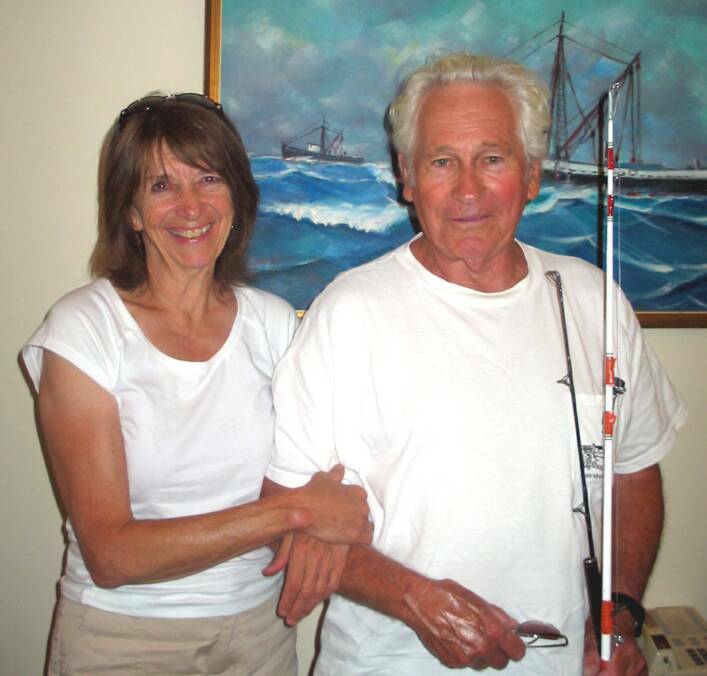 Steven is shown at left standing beside his wife, Susan, before a painting another renowned fisherman, Ellery Thompson. 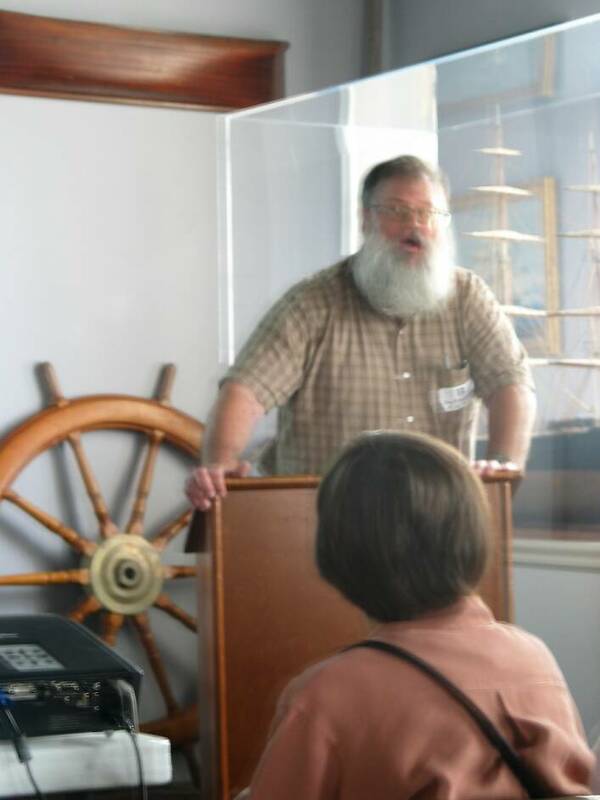 7.30.09 Head docent Bill LaRoue ably represented the Custom House at this month's meeting of the Friends of Fort Trumbull. 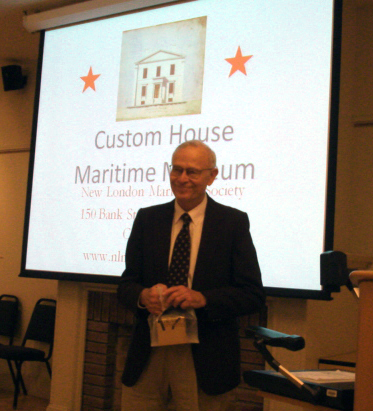 Bill gave a presentation about the history and current programs of the New London Maritime Society. 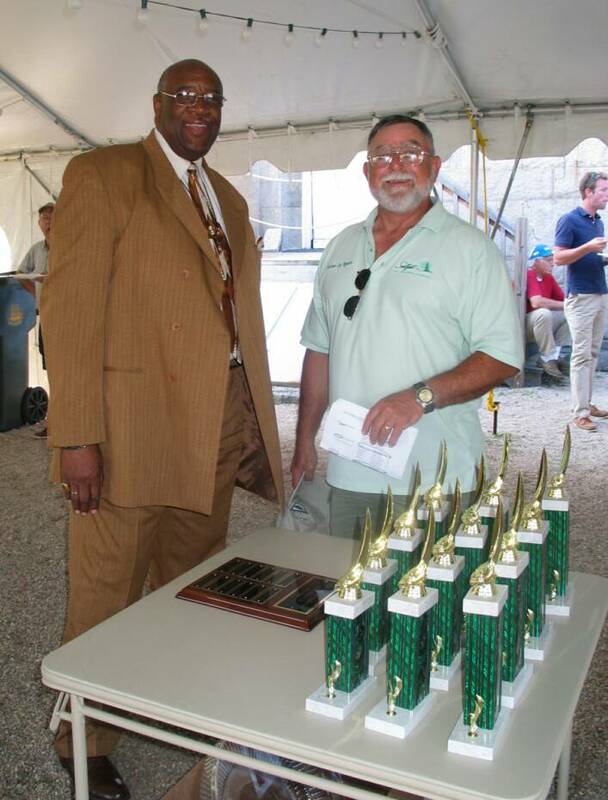 7.12.09 As a part of SailFest 2009, the Custom House hosted the awards ceremony for the 2nd annual New London Regatta. 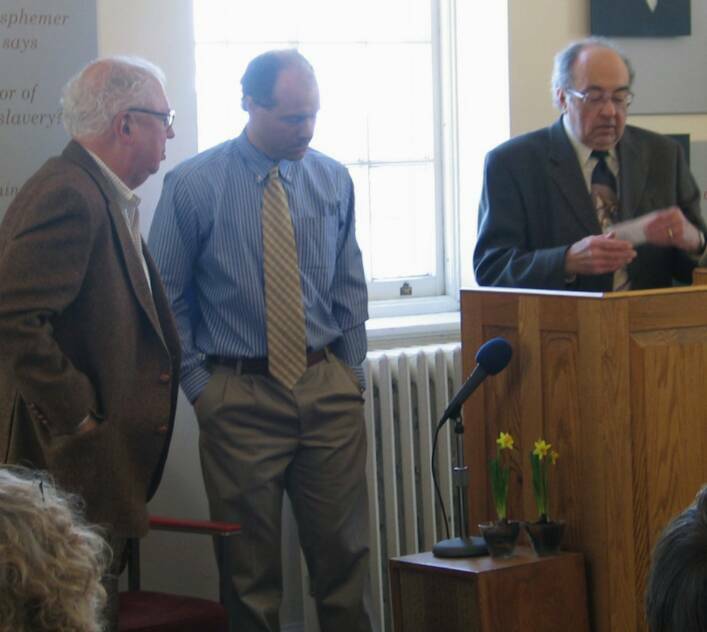 Master of Ceremonies was NLMS trustee Greg Roth, who was assisted by New London mayor Reverend Wade Hysslop. 7.23.09 Three generations of knotters were represented at this month's Third Thursday Jibboom Roundtable. 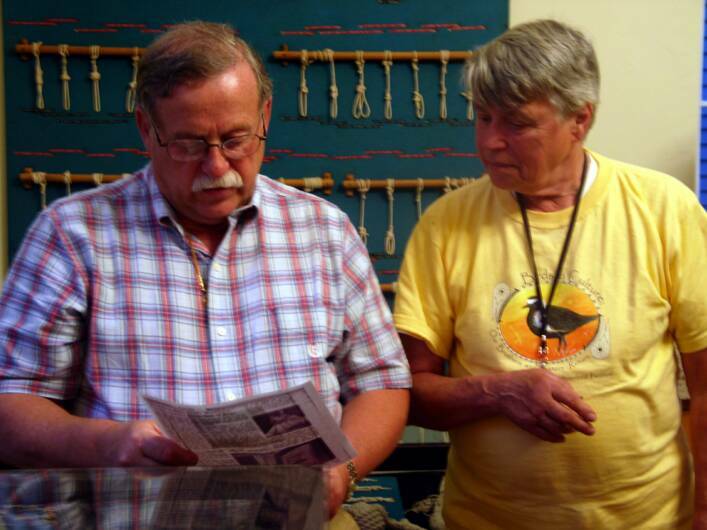 Alton Beaudoin's son, Jim, and grandson, Matt, were part of the extensive Beaudoin clan who took turns speaking about the master knotter and his legacy, a legacy which currently is on display at the Custom House. 6.20.09 On Saturday, our sister custom house in Newburyport, Massachusetts (which for 50 years has served as a Custom House Maritime Museum), hosted a stimulating all-day symporium on the New England Custom Houses of Robert Mills. 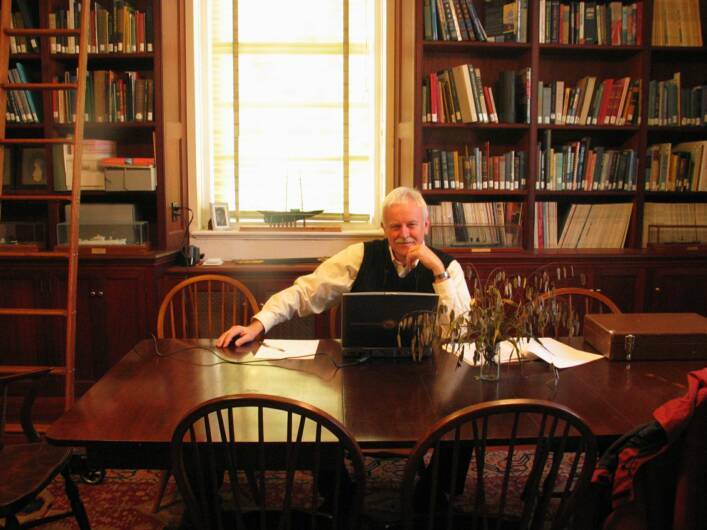 Architectural historian John Bryan gave the key-note address--an overview of Robert Mills's career--and representatives from all three of Mills's remaining New England custom houses discussed preservation challenges of the 175-year-old edifices. New London was represented both by NLMS trustee & treasurer John Desjardins, who emphasised the challenge of raising MONEY(!) and the director. 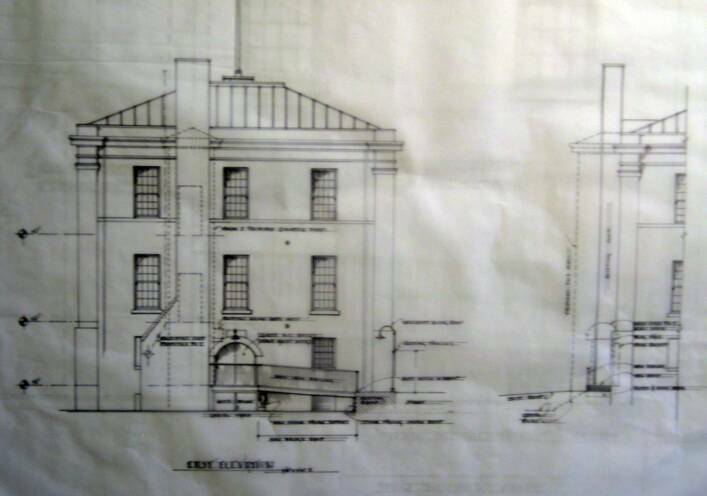 Architectural preservationist Andrea Mones, who has helped preserve several of Mills's buildings and studied all three custom houses, illuminated what is similar and distinct to each building. 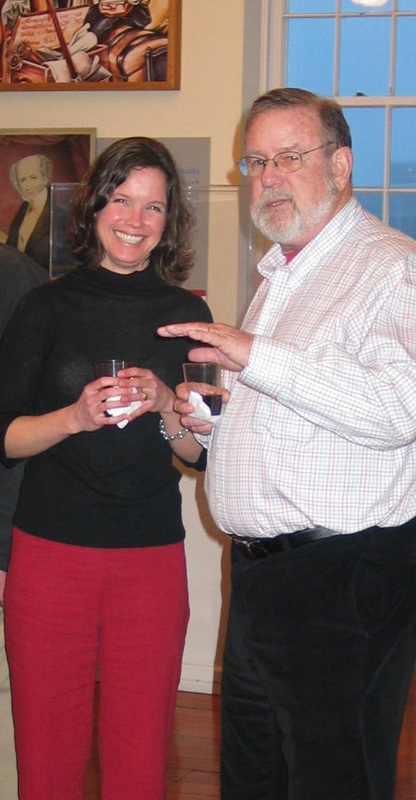 Two of our Newburyport hosts are shown at left: architect Paul McGinley, (who also helped preserve New London's Union Station), and Newburyport Custom House Maritime Museum curator Carol Ann McPherson--our museum's new best friend. 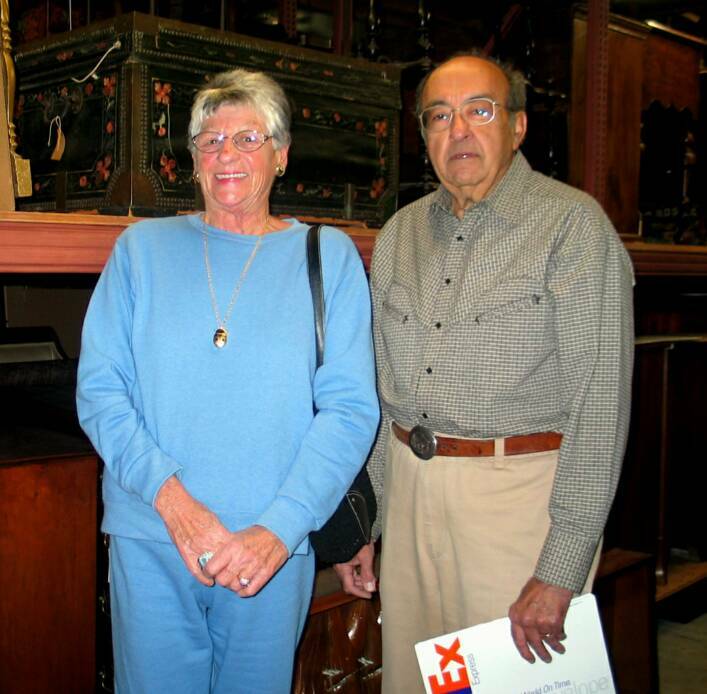 They are standing beside an original US customs desk, ca. 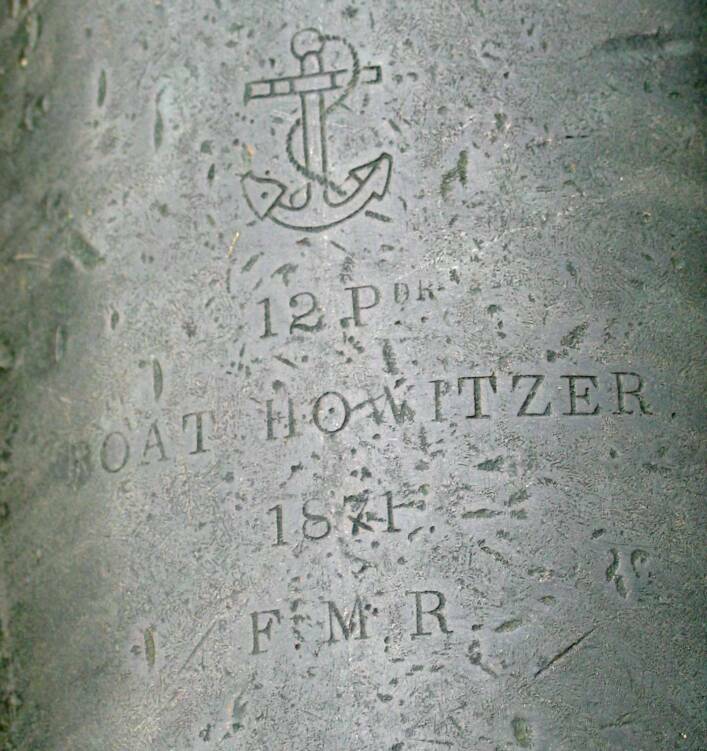 1835, of the sort that would be brought out onto the pier to inventory cargo aboard ships. 6.17.09 In conjunction with our exhibition: The Parade: Gateway to New London, June's Third Thursday was a Jibboom Roundtable on what moderator Greg Stone called "a Dickensonian view" of the Parade's Past, Present & Future. 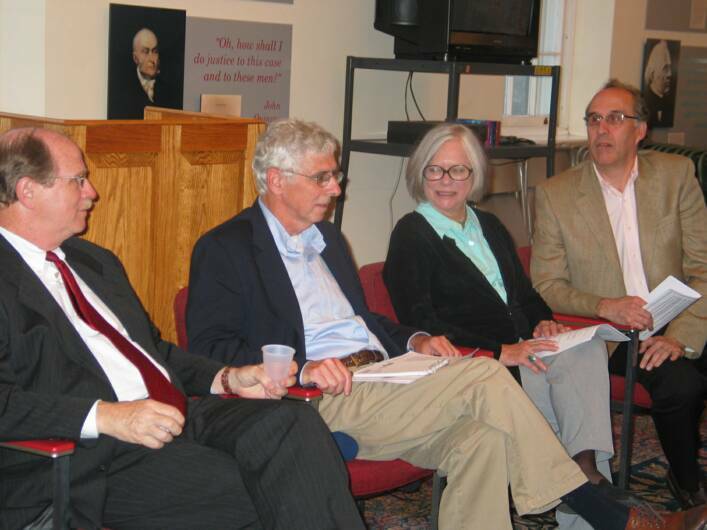 The panelists were, (from left) New London CIty Manager Martin Berliner, who spoke about the process of overseeing current construction; moderator & NLMS trustee Greg Stone; New London Landmarks director Sandra Chalk, who reviewed uses of the Parade site through history; and architect Sam Gardner, whose firm Gregg Weiss & Gardner are responsible for developing & overseeing the new design. 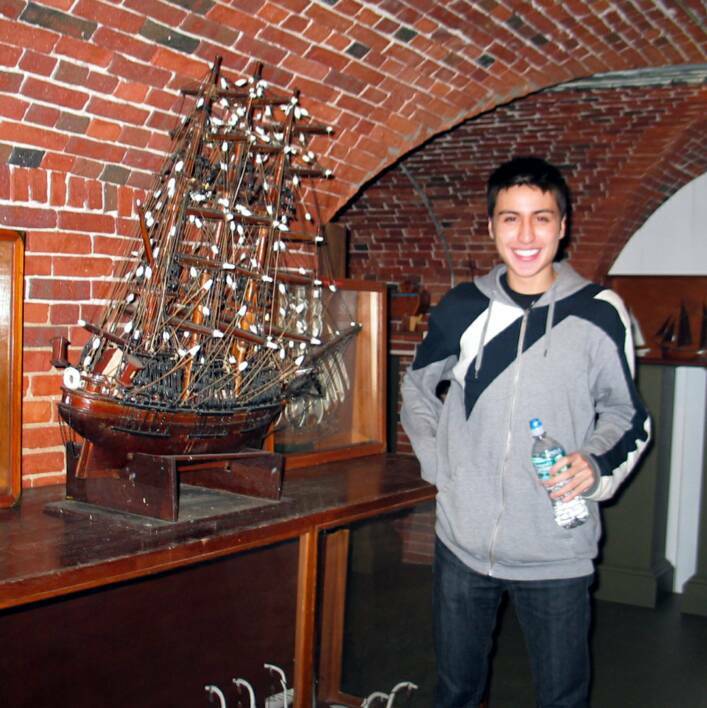 6.16.09 Thirty+ English as a Second Language students ended their semester with a field trip to the Custom House Maritime Museum. Their favorite exhibit? --PIRATES! 6.9.09 At last year's 2nd Annual New London Maritime Society CribbageFest, a fifth grader and his partner won the tournament on the last play of the last game. 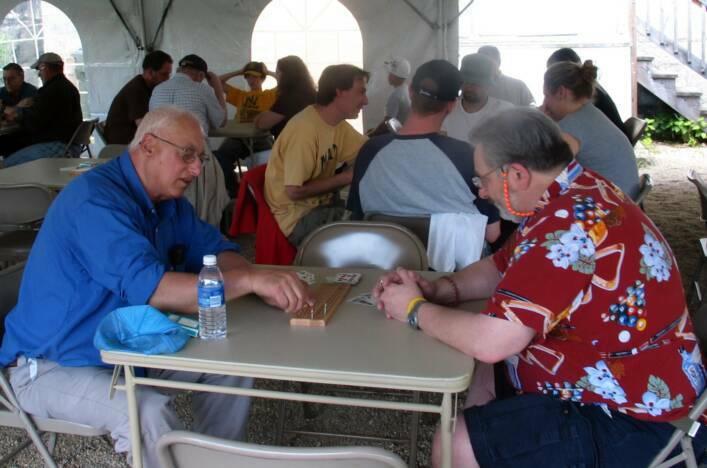 On Saturday, May 30th, at this year's CribbageFest III, Quantique White, now a sixth grader and his partner, Richard Beplat, returned to the finals only to be beaten by Ronald Davidson and Martin Leff. It was a best of three playoff between the top two teams and Ron and Martin won handily in the third game. Cribbagefest III first-place winner Martin Leff sent us this photo (left) of his prize--the board with the '29'--now displayed in his office. 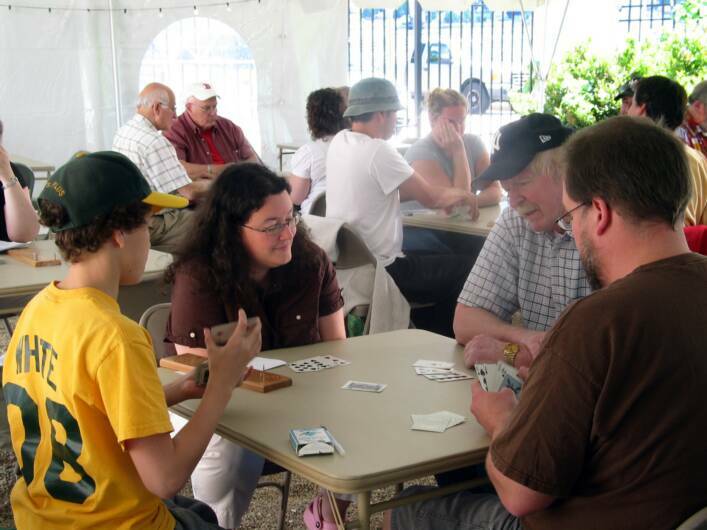 Next year's CribbageFest IV is scheduled for June 5, 2010, under the tent at the Custom House. Start practicing, Fifteen Two! 6.8.09 John Desjardins related the story of the Amistad to 30 young students studying aboard the two Ocean Voyages ships you may have seen docked at the Custom House pier. The boats are out of Booth Bay Harbor, Maine. 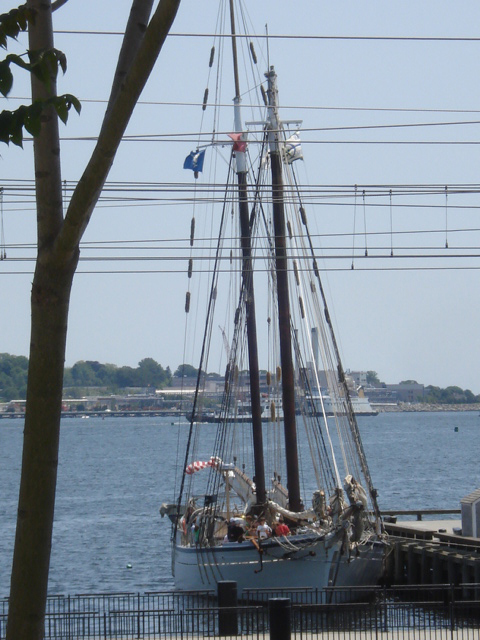 Students will spend a week aboard them learning to sail while visiting local places of interest. 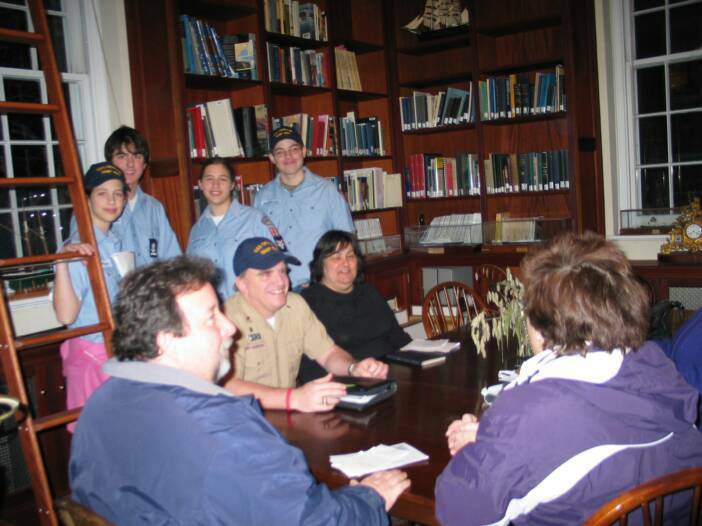 6.5.09 - GOOD NEWS - The Custom House Maritime Museum received $16,500 in Federal stimulus money by way of the City of New London Community Development Block Grant program. The funds will be used to create a handicap access ramp to the museum's lower level from the back courtyard. At far left is Roger Clement's rendering of the project, which he is designing in partnership with Benjamin Martin. 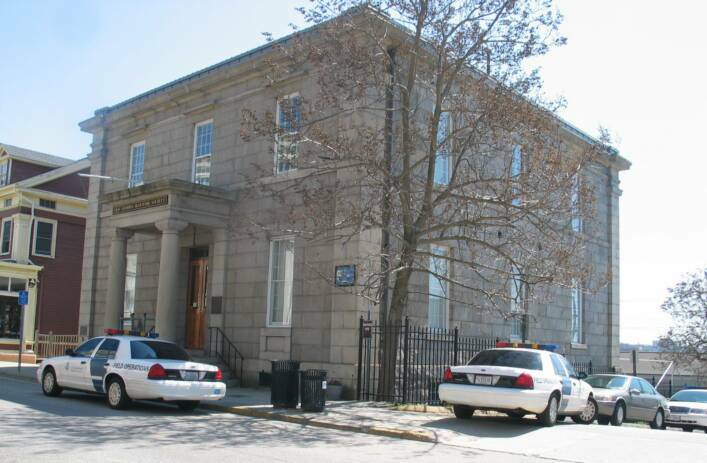 The Custom House Maritime Museum recently also received a Community Revitalization grant from Pfizer to help rennovate a storefront window across the street from the museum. 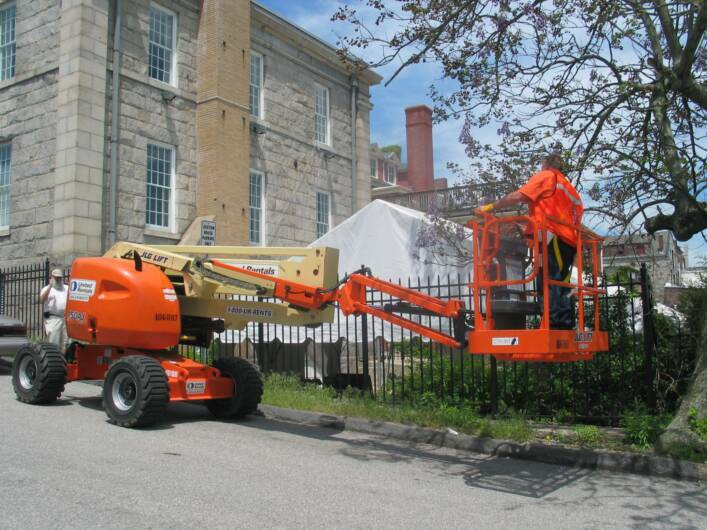 6.4.09 The bright orange cherry picker you may have noticed visiting the Custom House is part of a study being done to evaluate water penetration into the building. The study will be completed with the next two weeks and should provide a plan of action to solve leakage issues that--according to letters in our collection--have plagued the Cuatom House building for 175 years! 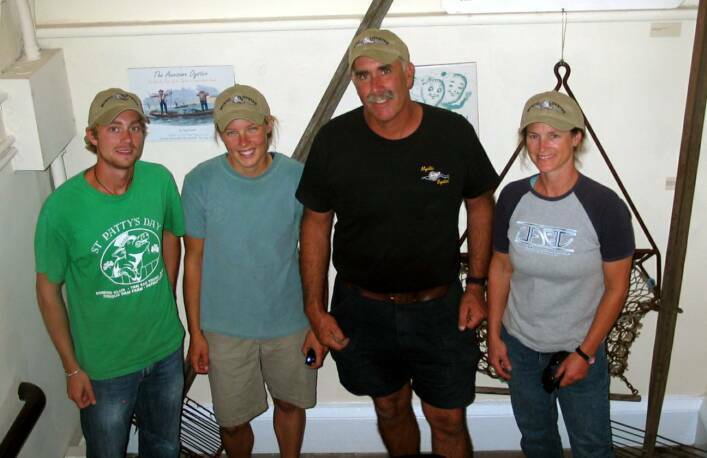 6.3.09 We are very pleased to have the help of several new & hardworking volunteers at the Custom House. At the far left Ti and Roger help reorganize the Lower level hallway. Near left, Lea and John hang photographs for the exhibition on New London's Parade. 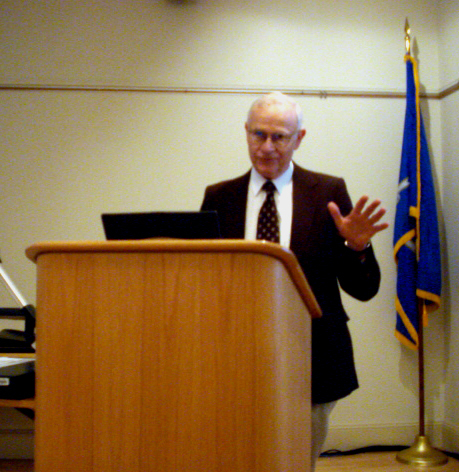 6.2.09 Artist, historian & collector Siro Toffolon spoke about 18th-Century Firearms & Accoutrements for June's 1st Tuesday Heritage Workshop. 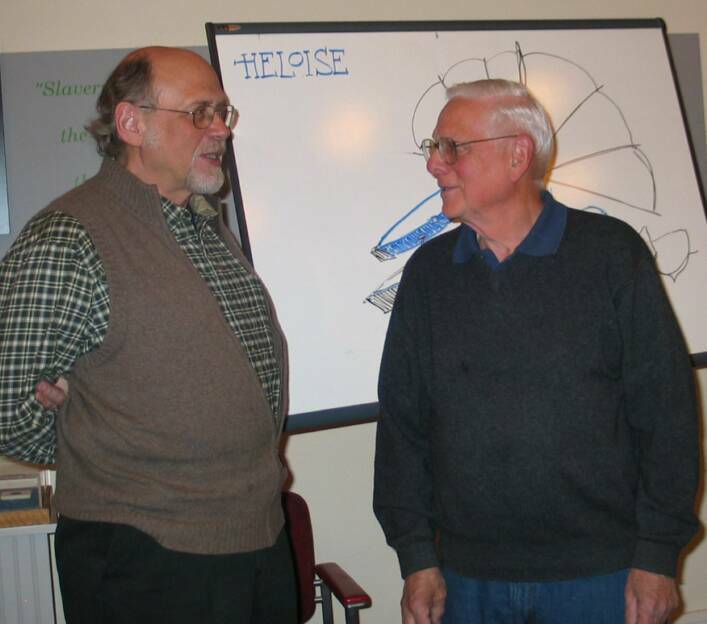 Mr. Toffolon was suggested to us by Dr. Harry Neilsen, a New London Maritime Society founder. Siro & Harry are shown at the near left behind a display of armamants Mr Toffolon brought to the lecture. 5.30.09 CribbageFest III took place Saturday under the courtyard tent. Employing a a new round-robin format, the competition allowed all the teams to all play all day! 5.21.09 Romantic pirate defender, Neal Kirk, aka Captian William Kidd, went head-to head with historian & Merchant Mariner Richard DeBold at our May Third Thursday Jibboom Roundtable - Pirates: Myth versus Reality. Here, near left, the two meet before the debate! 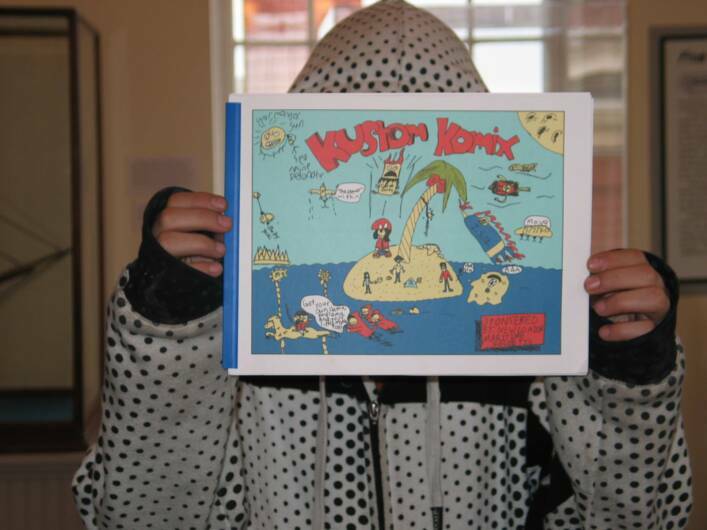 5.19.09 This was the last day for Tugboats & Little Toot: The Art of Hardy Gramatky. 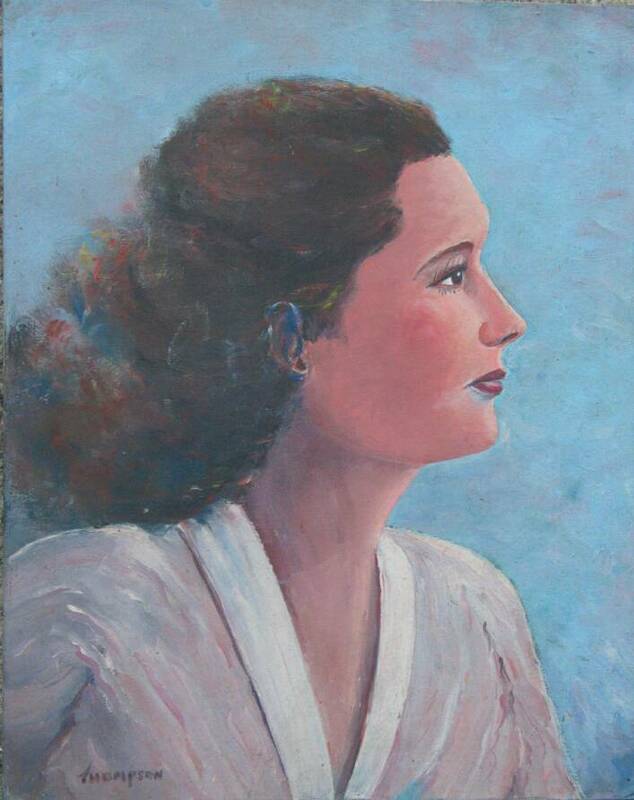 Linda Gramatky Smith, the artist's daughter, has become a real friend to the Custom House over the six months the exibition has been in our Maritime Gallery. 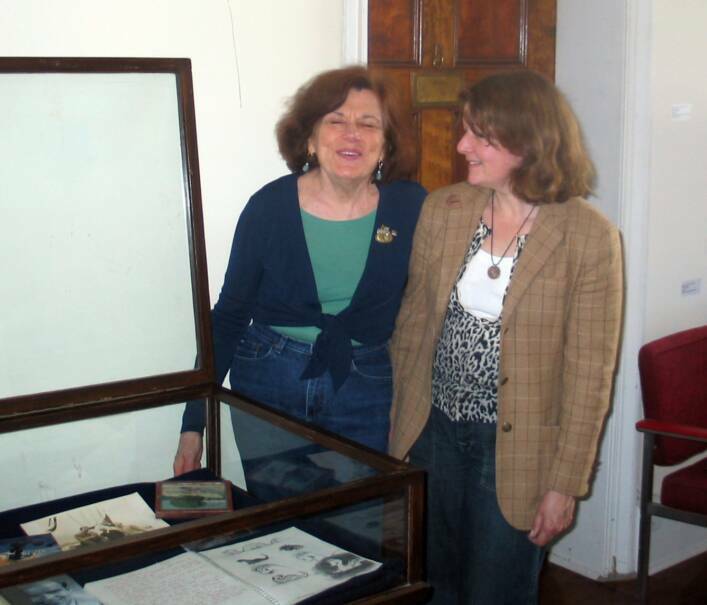 Linda is shown left with museum director Susan Tamulevich. 5.16.09 Following the Hope Week - National Maritime Day Parade, the Custom House hosted its 1st Annual Chowda' Fest & Silent Auction. The Jibboom Club (Flock Theatre) was there, too (see left)! Congratulations to your favorite Chowda' from FILOMENA'S & to Captain Scott's, Flanders Fish House, Red Lion Steakhouse & Sea Well Seafood. 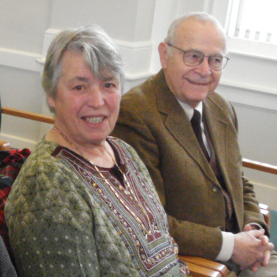 And thank you to our Chowda' Champ, NLMS trustee Kathy Gaynor (shown below, near left, with husband Bruce). Silent Auction Donors (our neighbors) include: ALVA 54 State Street - Amistad America Amistad Pier, New London - Bangkok City 123 State Street - Caruso Music 94 State Street - Children's Museum of Southeastern Connecticut - 409 Main Street, Niantic - Cross Sound Ferry 2 Ferry Street - Curves of New London 258 Bank Street - Filomena's Restaurant Utopia Centre, 262 Boston Rd., Waterford - GARDE ARTS CENTER 325 State Street - Hog River Journal - exploring Connecticut History - Hygienic Art 79 Bank Street - Lucca Wine Bar & Grill 165 Bank Street - Mange Tout 140 State Street - Muddy Waters Café 42 Bank Street - Muse Shoes/Gallery 102 Golden Street - New London Antique Center 123 Bank Street - New London Landmarks 49 Washington Street - New London Maritime Society 150 Bank Street - Northern India Restaurant 150 State Street - Robert's audio-video 90 Bank Street - Sound Music 165 State Street - Harkness Park - Studio 33 140 Bank Street - Thames River Greenery 70 State Street - The Day Publishing Company 47 Eugene O'Neill Drive - Waterhouse Salon 136 Bank Street - Whaling City Tattoo Museum LLC 140 A Green Street - media sponsor: www.the-e-list.com. 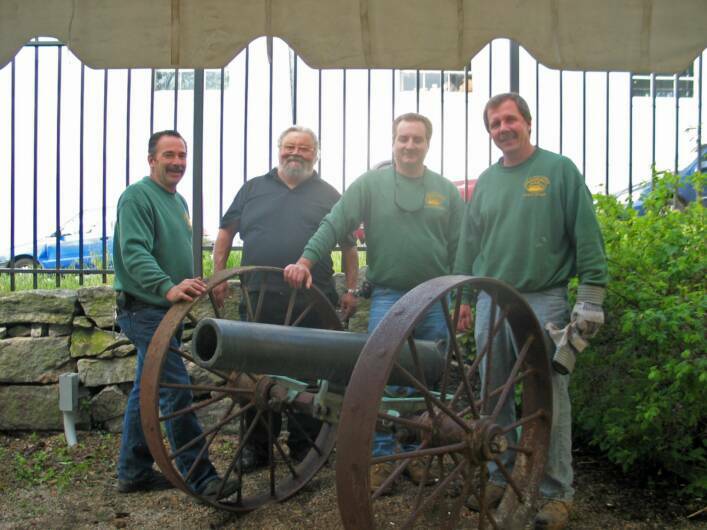 5.15.09 Friday morning, we were pleased to receive an 1881 Boat Howitzer, courtesy of the City of New London & delivered by the City's Public Works crew. 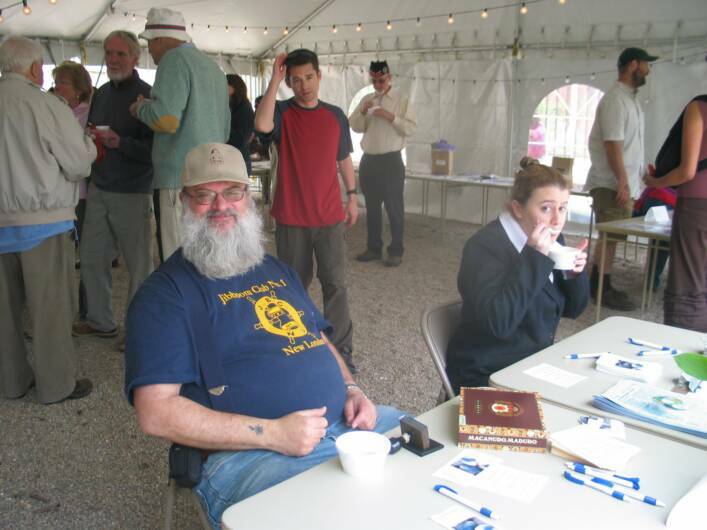 4.25.09 The day started at 10 AM with a visit to Bob Stewart and his model-making friends at the annual ship modelers exposition at Ocean Beach. 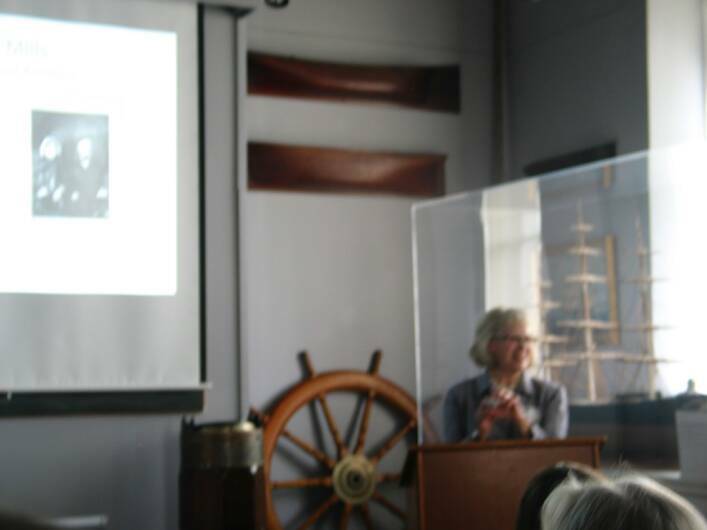 Bob showed the America, his project of the last year & which soon will be added to the ship miniature collection in the Custom House Frank McGuire Maritime Research Library. At noon the pirates arrived! 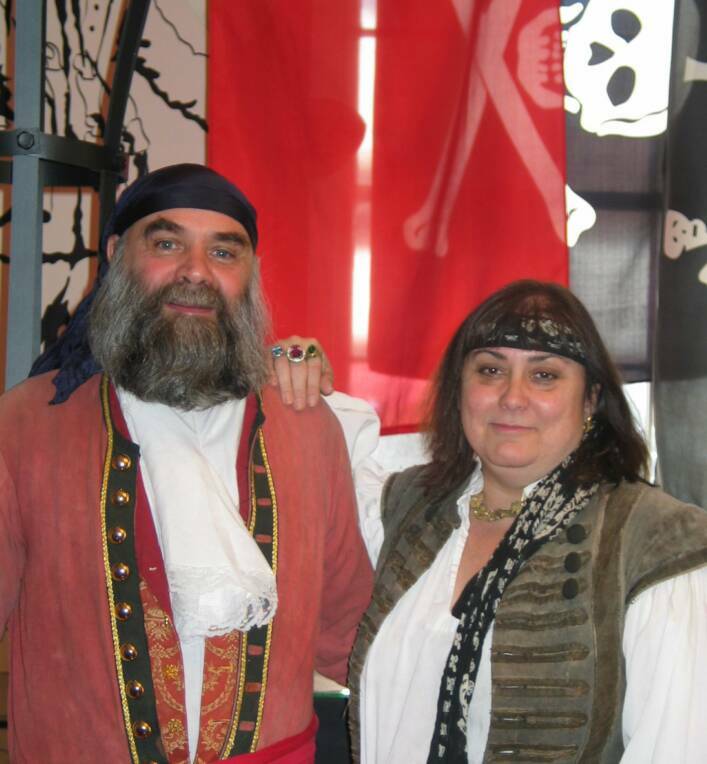 In honor of New London's first ever pirate convention, which took place over the weekend, Neal & Donna Kirk of Free Men of the Sea, a pirate historical reenactment group, graciously loaned the Custom House their collection of pirate booty--a special preview of what will be the Newport Pirate Museum (scheduled to open in late June, 2009). 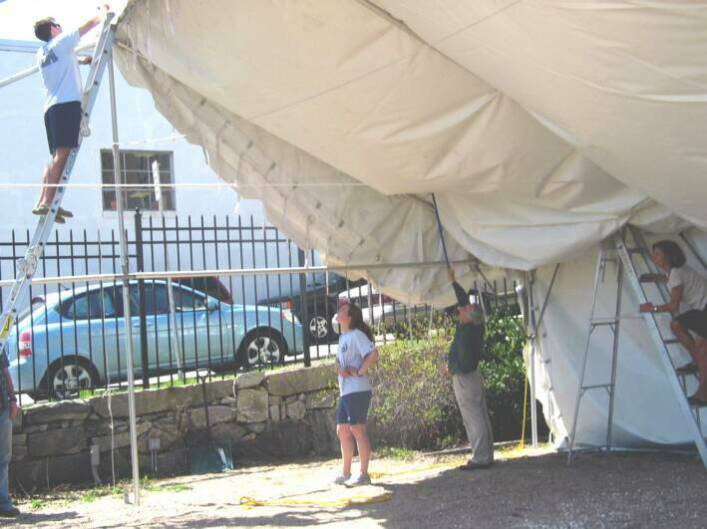 In the afternoon, three Coast Guard cadets and a squadron of NLMS trustees wrestled the tent covering onto the tent frame scaffolding. 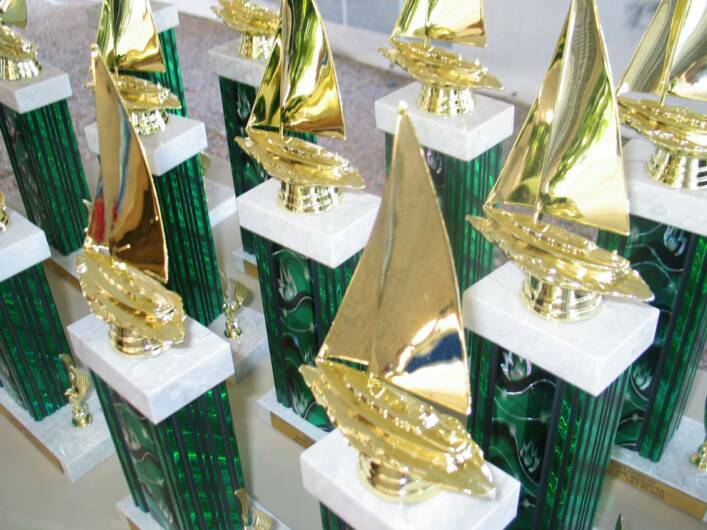 We are now ready for Chowda' Fest on Saturday, May 16, & the third annual CribbageFest on Saturday, May 30. 4.21.09 Fred Calabretta's Oral History Workshop for Museum & Library Professionals brought a dozen students to the Custom House from all over the state. Fred's next adult education offering will be the May First Tuesday Preservation Workshop: Preserving Famiy Memories., on May 5. 4.17.09 Anyone doubting we still are a functioning US Custom House need only to have driven by last Friday when the museum was host to a regional customs officials meeting. With greater attention directed at US ports this summer, we expect to be seeing more of Port Director Nick Hanke and his crew. 4.14.09 Today was the last of our first series of Cartooning classes. 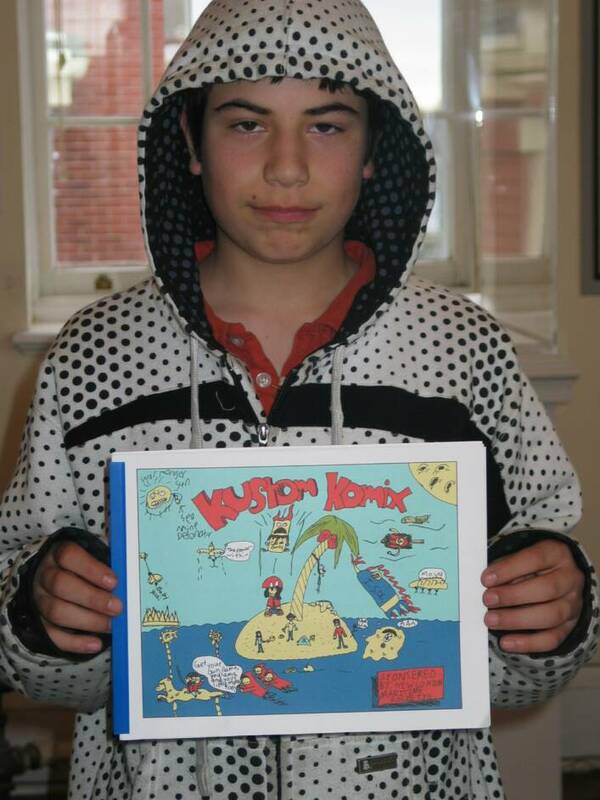 To mark the close, teacher & graphic artist Jon Buller made comic books from the work produced by students in the class. 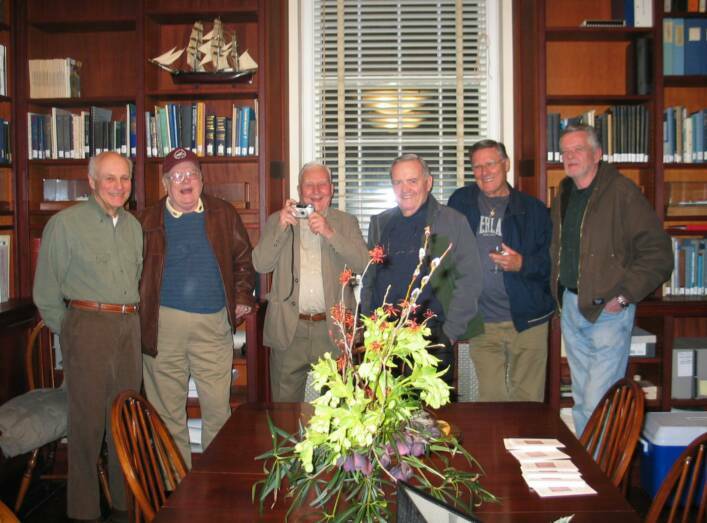 4.14.09 We are honored to have the Merchant Marine meet monthly at the Custom House. 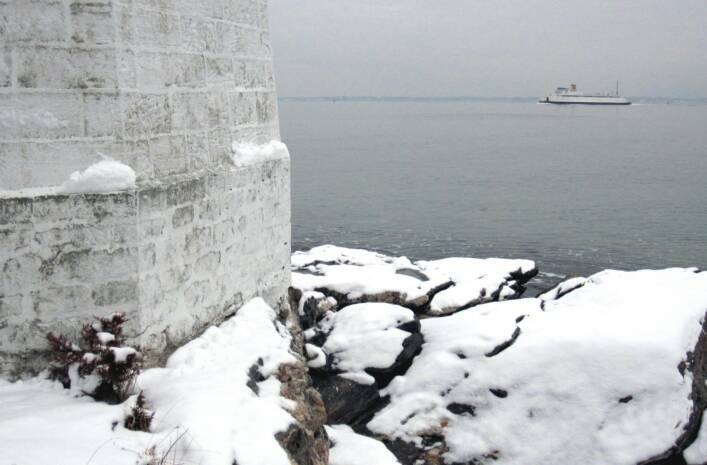 One date on their horizon is May 22, National Maritime Day and the annual memorial celebration held at Fort Trumbull. This day reflects the gratitude Americans have for the maritime industry and the benefits it brings to the country. It also recognizes ships and seafarers who have held a special place in the nation's history. The first commemoration of National Maritime Day, in 1933, brought the Governor of Georgia (the ship named the Savannah, departed from that city) and the Governor of Connecticut to New London for graveside services at the Stephens Rogers site in Cedar Grove Cemetery. JOINT RESOLUTION Designating May 22 as National Maritime Day. Resolved by the Senate and House of Representatives of the United States of America in Congress assembled, That May 22 of each year shall hereafter be designated and known as National Maritime Day, and the President is authorized and requested annually to issue a proclamation calling upon the people of the United States to observe such National Maritime Day by displaying the flag at their homes or other suitable places and Government officials to display the flag on all Government buildings on May 22 of each year. [Mariners] have written one of its most brilliant chapters. They have delivered the goods when and where needed in every theater of operations and across every ocean in the biggest, the most difficult and dangerous job ever undertaken. As time goes on, there will be greater public understanding of our merchant's fleet record during this war [World War II]. 4.11.09 Ship model makers held their meeting this month at the Custom House. 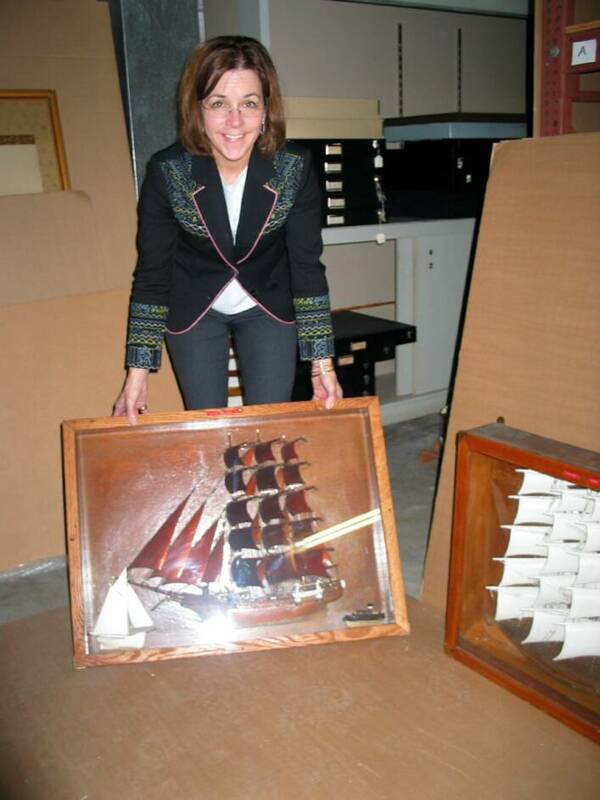 They were here, in part, to see Robert Stewart's ship miniatures, now on view in the Frank McGuire Research Library. 4.13.09 It truly is a different world here at the Custom House! The last two weeks have been transformative, with the results that the museum is now finally able to properly manage its collections in a new collections storage facility filled with splendid new cases, &, in addition, the lower levels of the building are both reorganized and cleaned to allow us to move forward with plans for food-prep & exhibition-prep areas--goals that seemed pipe-dreams just a few days ago. 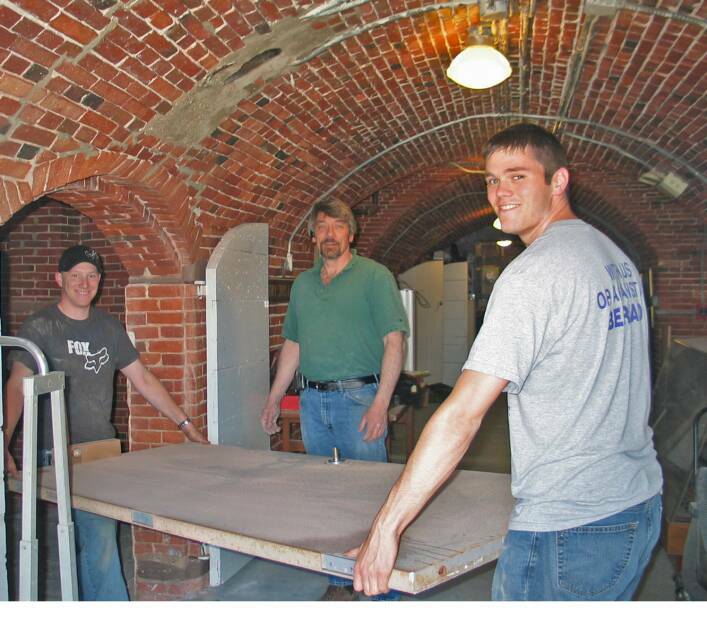 When we left off (3.28.09), Coast Guard Cadets were moving our stuff...What was already there in the lower level and sub-basement was hauled, sorted, cleaned & stacked. This was followed by a professional cleaning of the sub-basement by ServPro of Middletown. 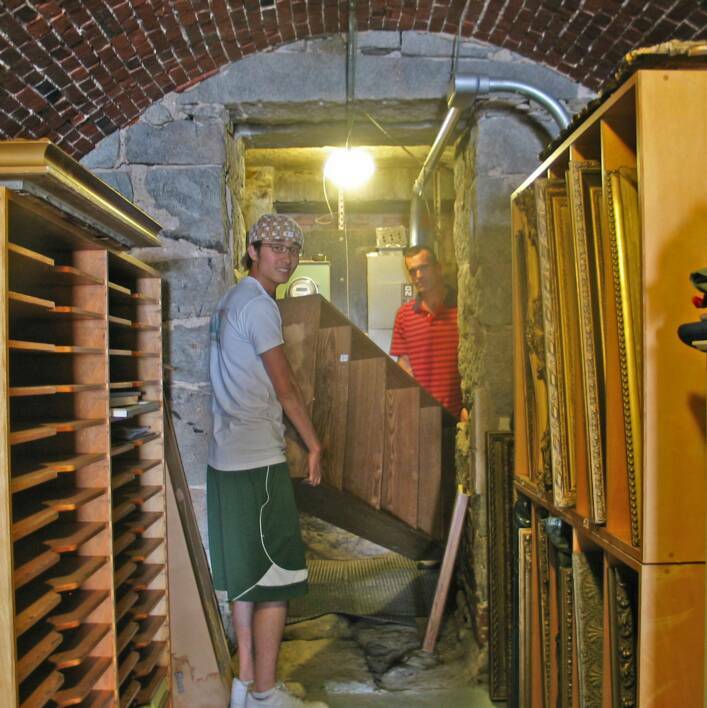 Rogovin Moving & Storage generously moved the cases from New Haven to New London. 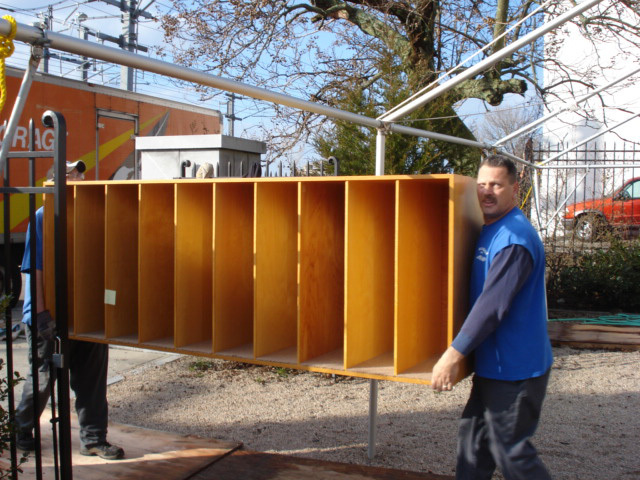 On Tuesday, April 7, Rogovin's expert crew brought in 30 splendid collections storage cases--generous gifts to the museum from Yale University Art Gallery. 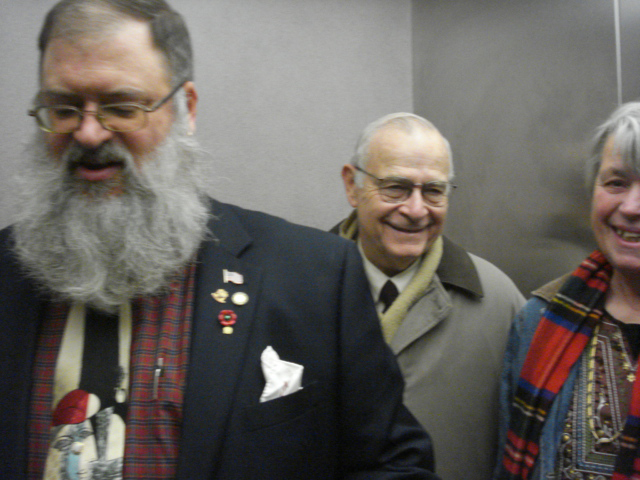 Look left to see our heros at the Yale University Art Gallery, Joe Branco (right) and Richard Moore, who made all of this possible. Thank you. 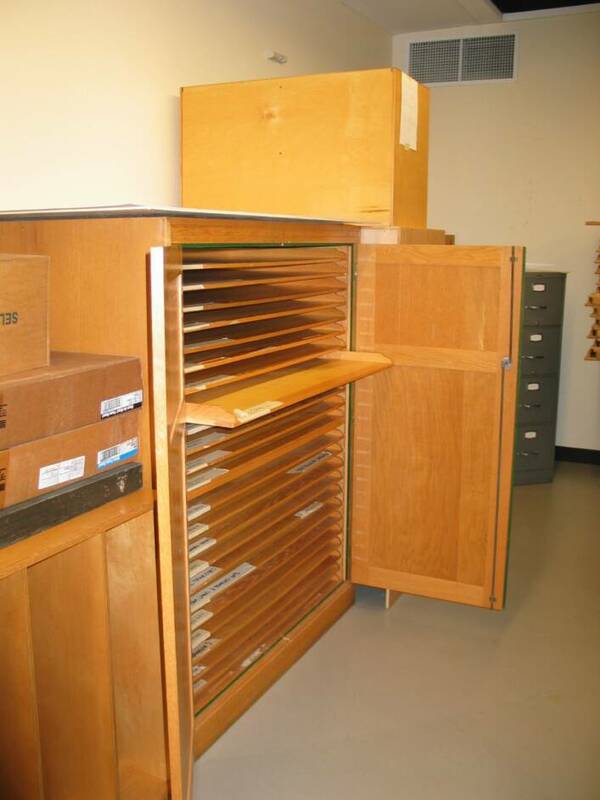 3.28.09 We have worked ourselves ragged this week preparing for Yale University Art Gallery's gift from of many elegant oak collections-storage cases, due to arrive on Monday, April 6. Thank you to Coast Guard cadets 1/c Dylan Sapia and Matt Dyrdahl, who did an extraordinary amount of heavy lifting & logistics work for us this Saturday in our lower level and sub-basement spaces. 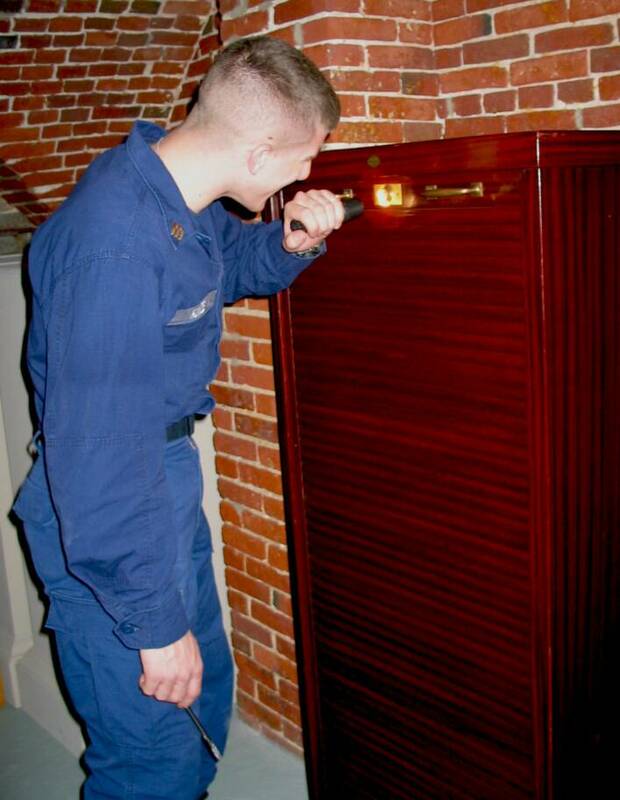 Thanks, also, to Alfred Conroy, who quickly & efficiently removed a monumentally heavy metal fire door that had been bedeviling us since mid December, to HMC Roy Treadwell from the Navy Submarine Base, and to George Sprecace, Bill LaRoue, and new NLMS board member Robert Groves for their help throughout the day! 3.21.09 Founders Day 2009 ended with an evening opening celebration of modelmaker Bob Stewart's collection of miniature ship models in the library. 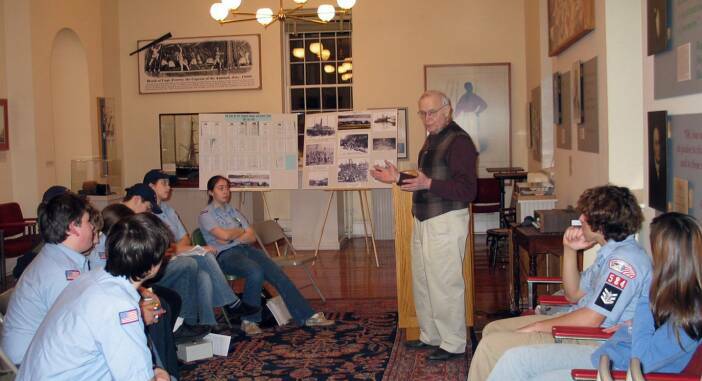 Bob Stewart is shown, at left with camera, that evening with his modelmaking cohorts. 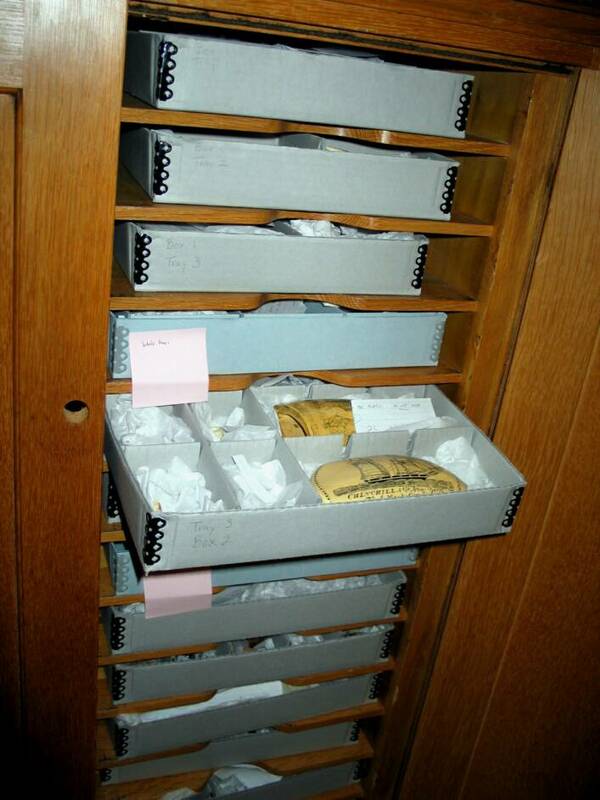 In the photos you can catch a glimpse of Bob's models and their research notebooks, which are installed at about shoulder height in a band in the library shelves. They fit so perfectly in the shelf spaces, it is truly remarkable! Thank you, Bob, for this amazing gift. 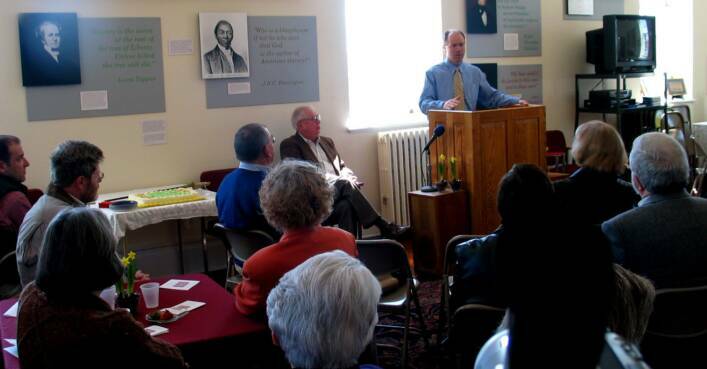 3.21.09 Founders Day 2009 started off with a celebratory Tea featuring author Jeff Benedict. 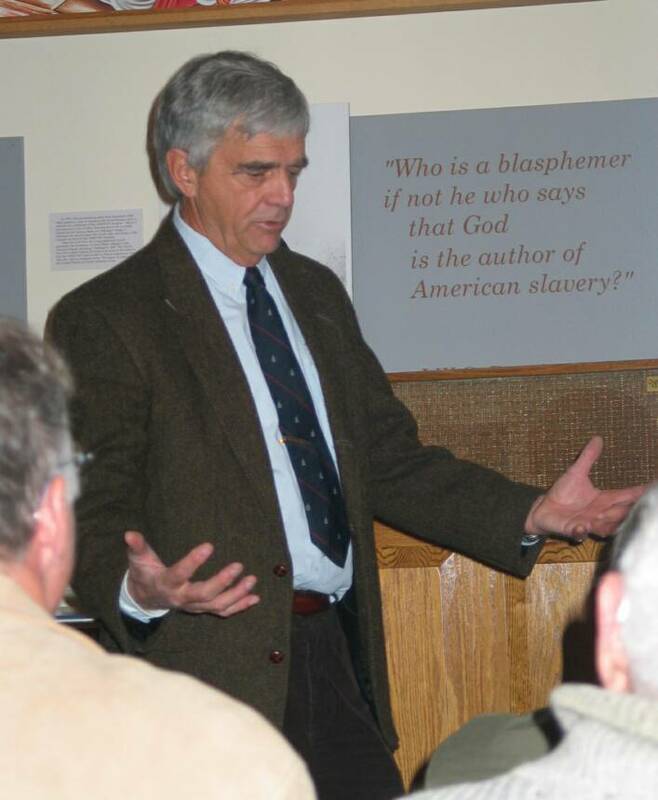 We were honored to host Jeff for his first solo talk in New London following the publication of his latest book 'Little Pink House', which chronicles the Fort Trumbull - eminent domaine case. 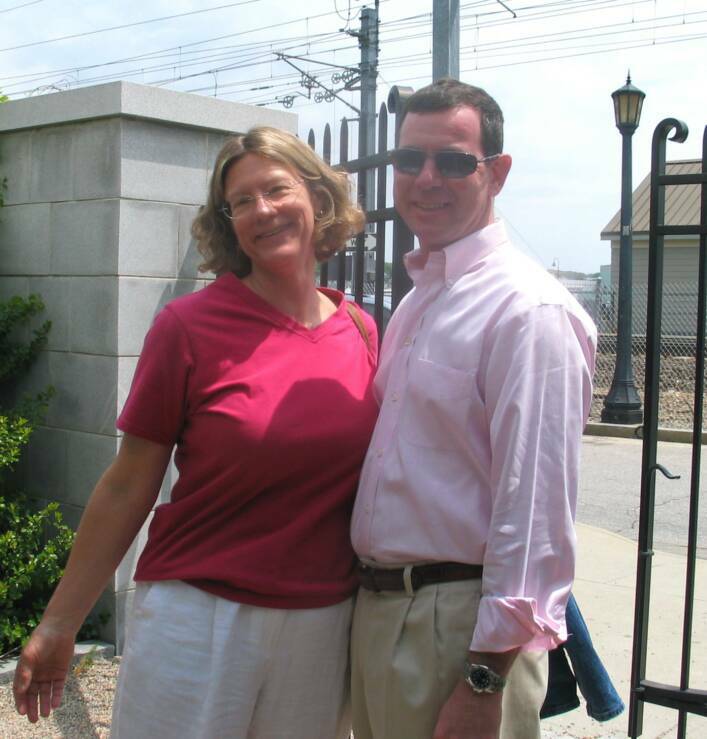 Jeff, now living in Virginia but native to New London, outlined his career and answered questions about his extraordinary experiences as an investigative reporter. 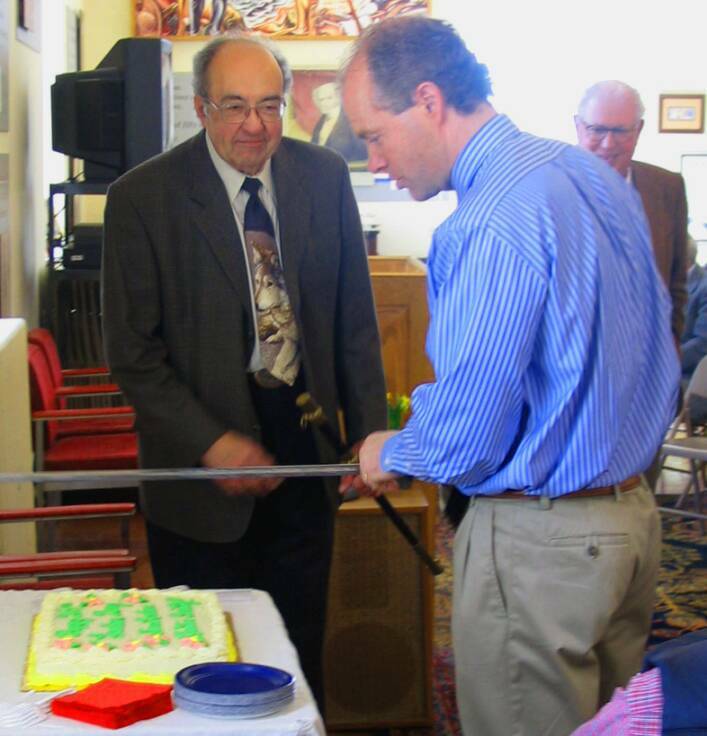 He then capped the event by cutting our cake with the ceremonial Heidenreich sword! Jeff Benedict is shown, left, addressing the crowd, with New London Maritime Society founder Morgan McGinley and president George Sprecace, and then slaying our delicious carrot cake! 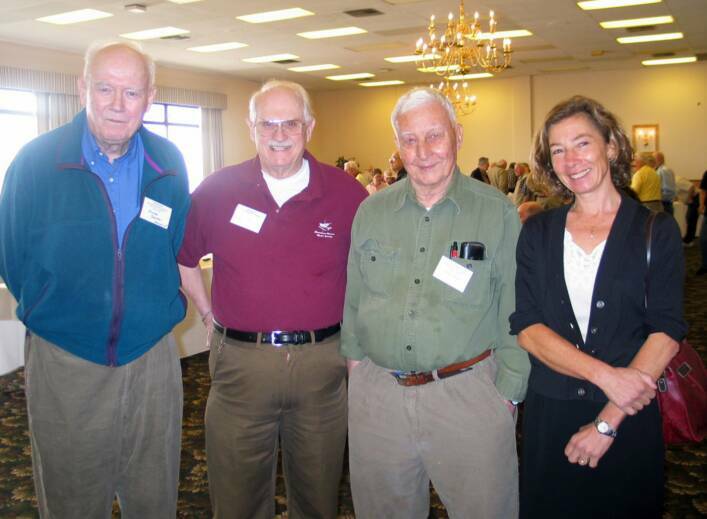 New London Maritime Society Founders in attandance included Lloyd Beachy, Morgan McGinley, and Dale Plummer. 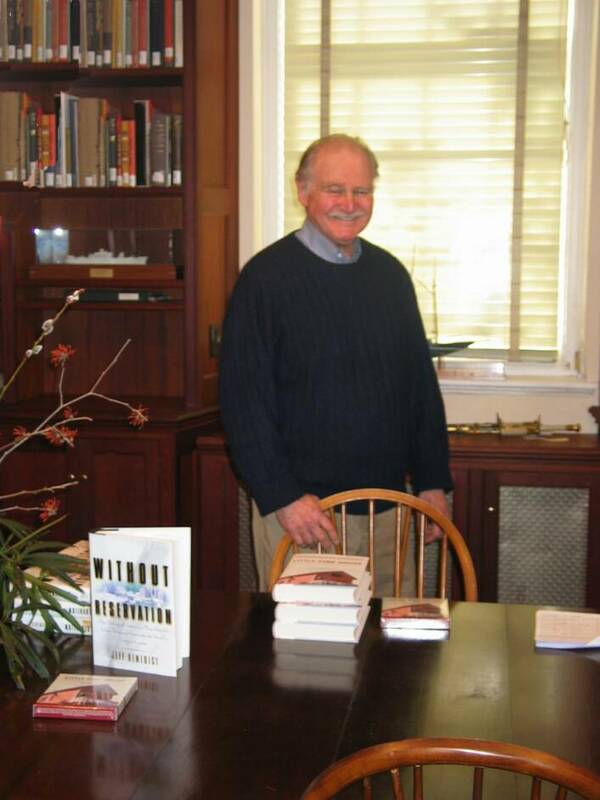 NLMS past president, architect Ben Martin is shown in the library which he designed for the Custom House prior to the festivities. 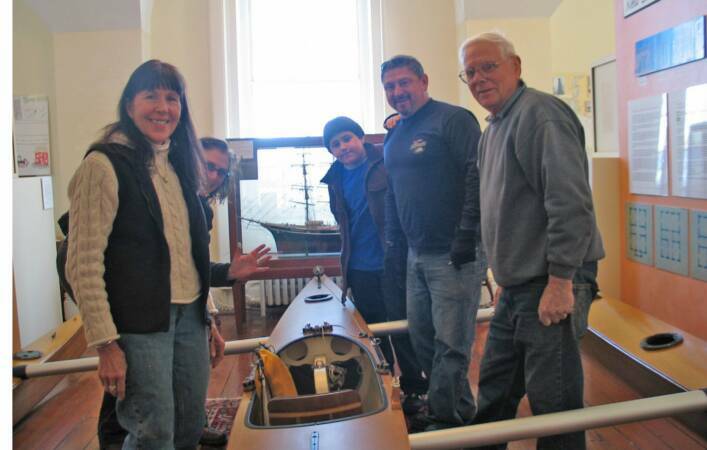 3.13.09 Old Lyme boatbuilder David McCulloch & crew descended upon the Custom House today to install his elegant green trimaran in the Ingoldsby W. Crawford gallery. On Thursday, March 19, David will join graphic novelist Jon Buller to give our Third Thursday talk. 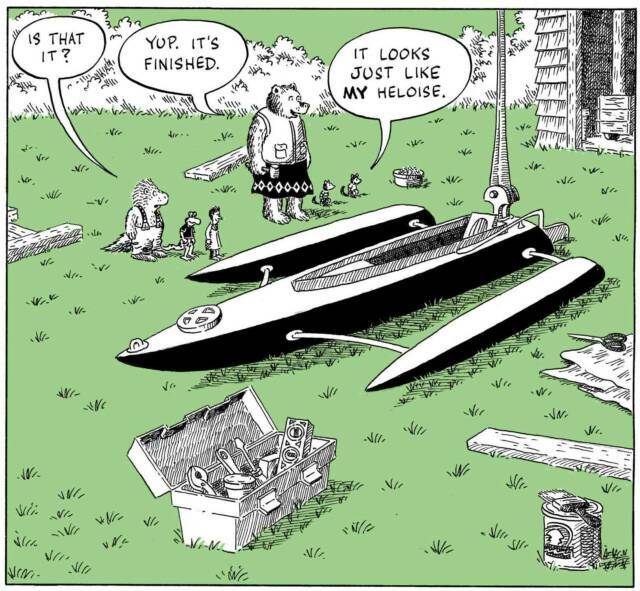 Jon Buller will discuss how he adapted David McCulloch's boat to fit the needs of the fantasy novel, and David McCulloch will discuss the real-world boat and the design considerations that went into its construction. The boat itself, seen left, will be on display in the museum. Read about in on Lymeline. 3.11.09 Now that our 2008-2009 Annual Fund has been tallied, we are gratified to note that this year's total surpasses 2007-2008 by +30%--this when all else around us seems to be headed in the opposite direction. Thank you to everyone whose positive support made the difference! 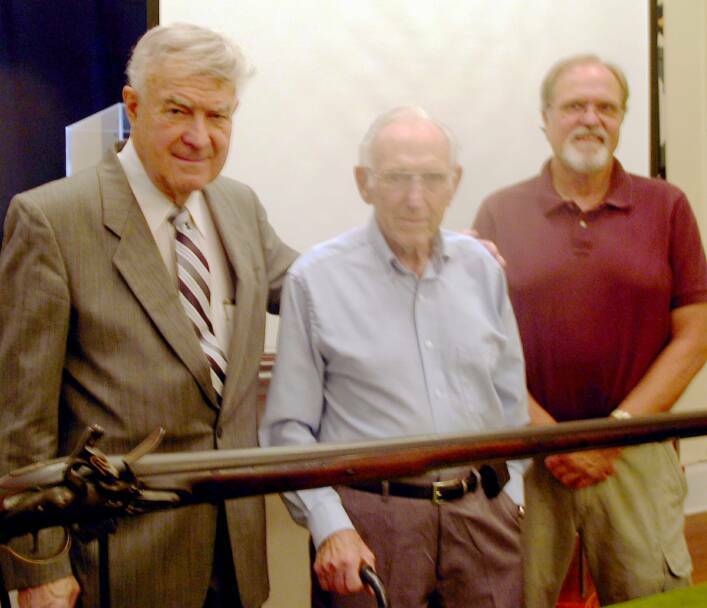 3.9.09 We note, with sadness, the passing of C. Daniel Wolverton, a naval engineer and founding member of the New London Maritime Society. 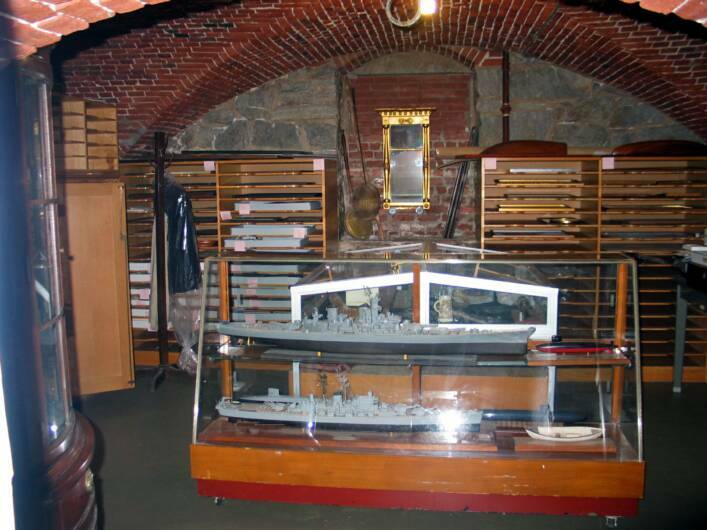 Dan was instrumental in the development of our maritime library collection, a dedicated museum docent, and most recently, as a special project, he researched and documented the battle ship models in the museum collection. A constant and loyal supporter of NLMS, he will be missed. 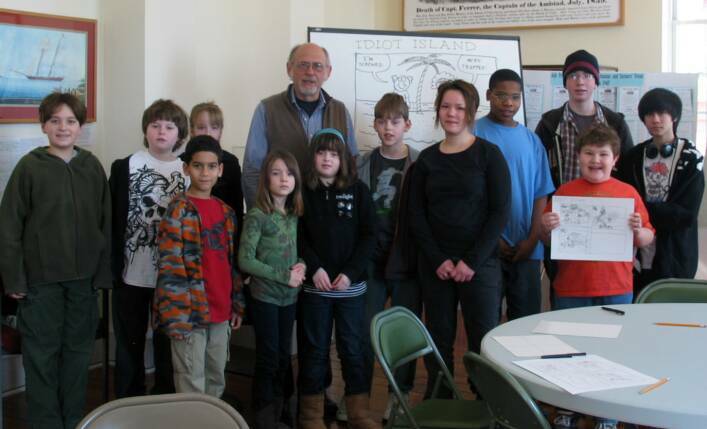 3.7.09 Our first Cartooning Workshop with graphic novelist Jon Buller met today! Here, left, is the gang. 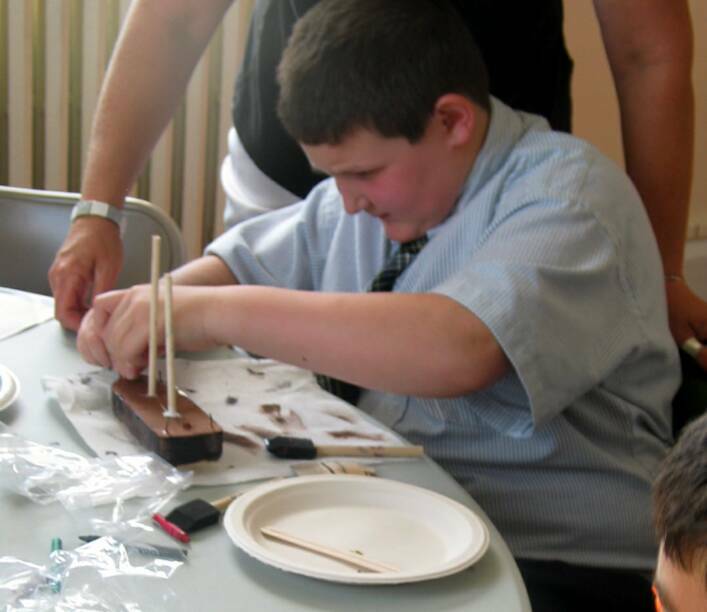 3.3.09 This winter, the Custom House lunched a new education program with classes for adults and youth that build upon exhibitions and special events at the museum. 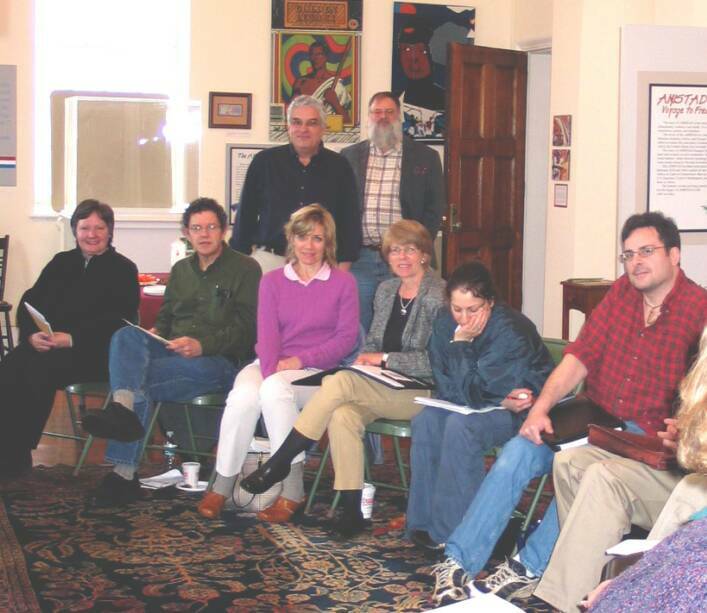 Our first class, on the taking of Oral Histories with Fred Calabretta, had a respectable dozen students in attendance, including 5 who were completely new to the museum, one new membership, and a (welcome) bonus cash donation. 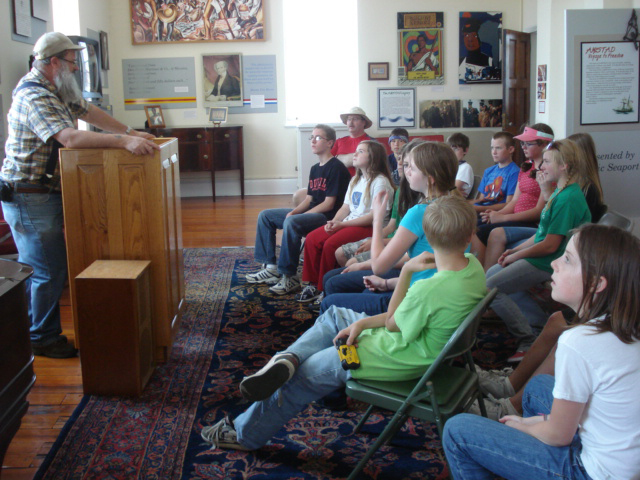 In 2009, with new initiatives such as our education program and private room rentals, we hope to have the museum grow and thrive in challenging times. 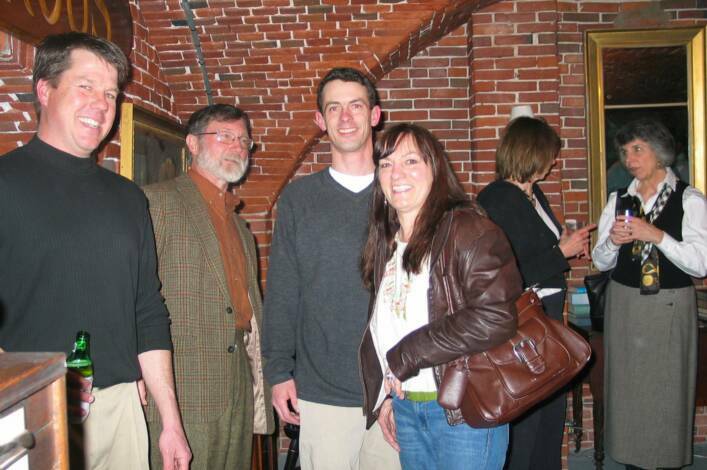 2.19.09 Our February Third Thursday lecture - Working Tugs in New London: A Jibboom Roundtable, was a teriffic success. Thanks go to our speakers, intrepid mariners all (at left from left): Robert Hauser, Harry Roit, Patrick Kennedy, Adam Wronowski, and Rob Groves, for giving us an evening we won't soon forget! 2.17.09 One of the best, but least-known resources of the Custom House is the Frank McGuire Maritime Research Library--a collection of books, letters, logs, manuscripts, post cards, photographs, audio & video recordings, and ship models. This spring, under the able guidance of Brian Rogers, we are reorganizing the library and working to get its holdings online. Watch this site! 2.16.09 Thanks to the intervention of our friend, preservation architect Andrea Mones, a team of paint analysts visited the Custom House several weeks ago to look at the paint-and-trim history of the building. Among their discoveries were three campaigns of faux finish trims in the main gallery and this plank from a customs shipment circa 1860, which had been used, upside down, as a shelf in one of our cabinets. 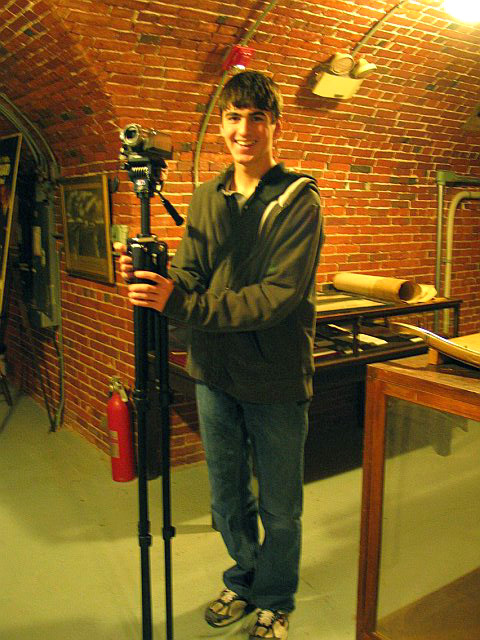 2.12.09 This week we were pleased when Nick Woviotis, a Sea Scout who first visited the Custom House two weeks ago, returned to make a video for Stonington High School's Fox 61 Student News. Nick, shown here with NLMS treasurer John Desjardins, interviewed Head Docent Bill LaRoue and Museum Director Susan Tamulevich for his news feature. 2.11.09 Keep your fingers crossed: we have applied for funding to help sponsor artist Joe Standart's new project Portrait of the Waterfront, which should take place in New London this very summer! New London residents will remember Joe's remarkable Portrait of the City from several years ago. 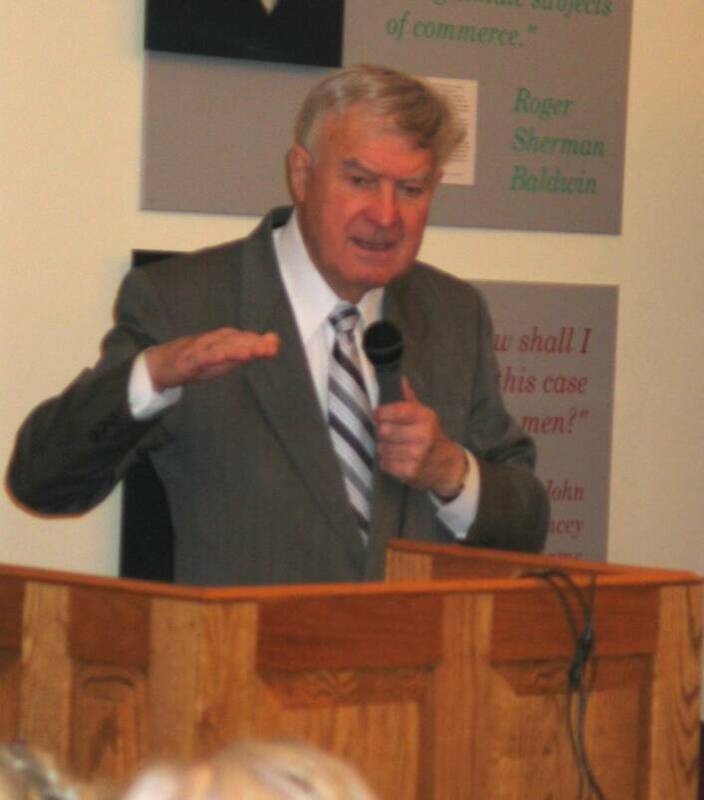 The Custom House's role will be to provide Joe a home base in New London as well as research support. 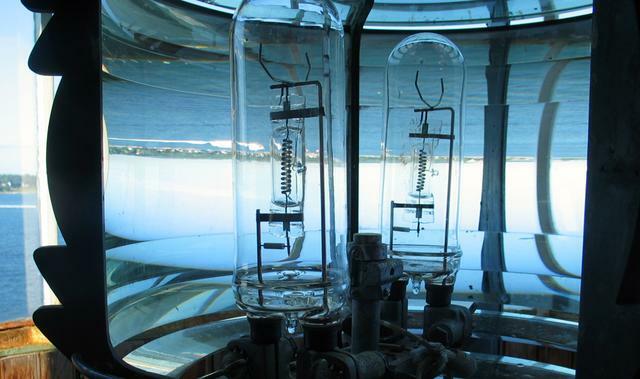 2.10.09 We've started our Spring Cleaning--& began with the lighthouse Fresnel lens--which has never looked better! Any one who likes to clean, paint, fix, build or organize is welcome to join in! Call Susan at 447-2501.
for sponsoring our new cartooning classes with Jon Buller . 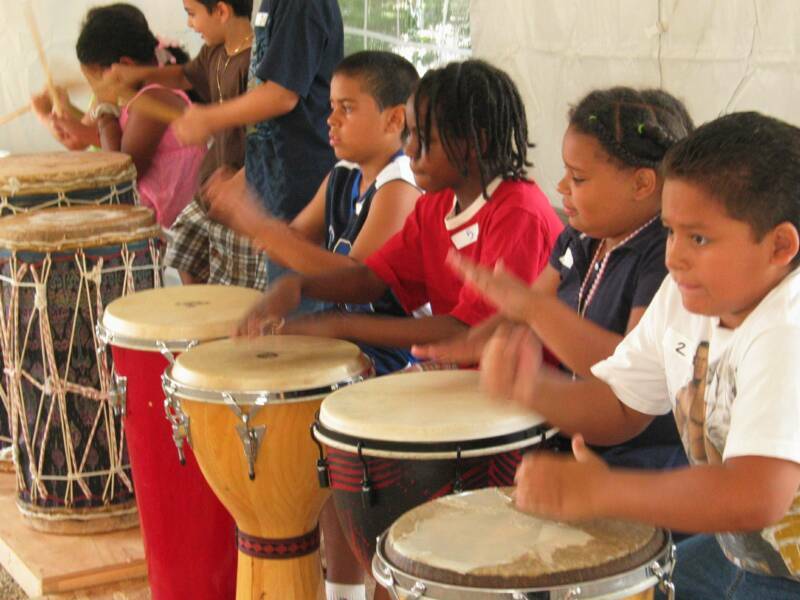 Thanks to J. Solomon, Inc., the museum will be able to provide all supplies for the classes without additional charge. 1.27.09 The WINTER 2009 newsletter was mailed this week. Click on the above link to read it online. 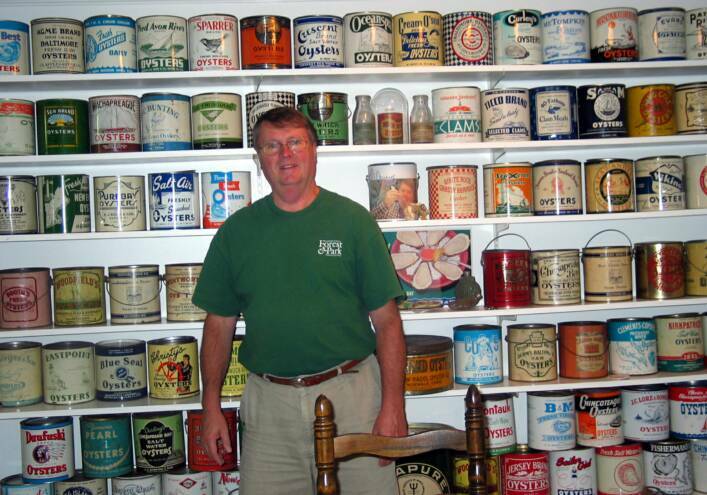 1.27.09 Tugboats & Little Toot: The Art of Hardie Gramatky continues to make the news. This week a short feature article on the show, written by Roger Zotti, appeared in The Resident. A photo and mention of Little Toot also appears in the Feburary issue of Connecticut Magazine. 1.26.09 We hear this comment almost every day, but it was a genuine shock when the New London Sea Scouts Ship Dragon - Ship 584 met at the Custom House on Monday night and we learned not one of the Scouts had ever visited the Museum before! To make up for lost time, the Sea Scouts got a through tour of the building ending with a dramatic rendition of the Amistad Incident by head docent Bill LaRoue. Of course, they loved it. We were delighted to have them visit and look forward to having the Sea Scouts back at the Custom House very soon. 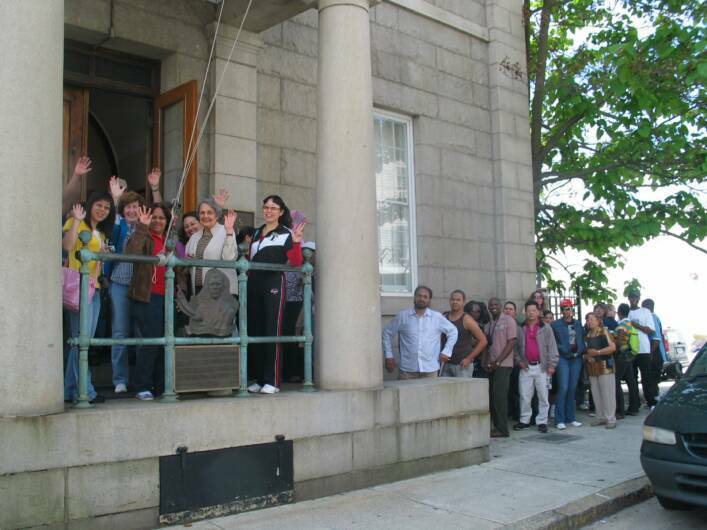 If you know of a maritime group that might not know the Custom House, please have them call us: 860-447-2501. 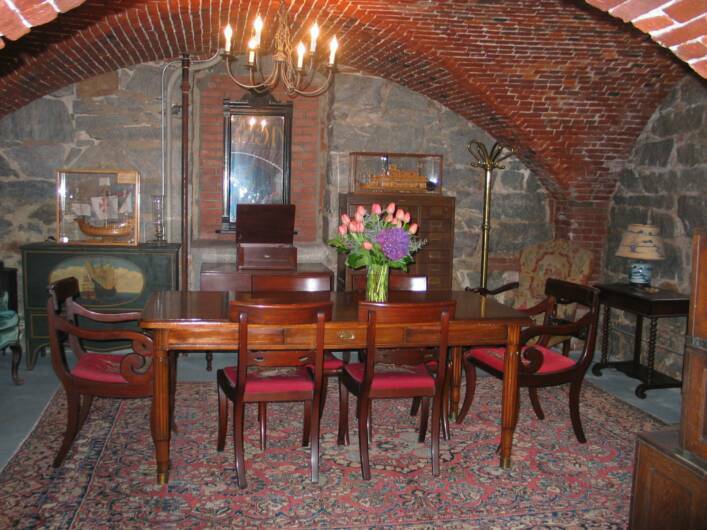 We're happy to host a meeting or arrange for a special behind-the-scenes tour. 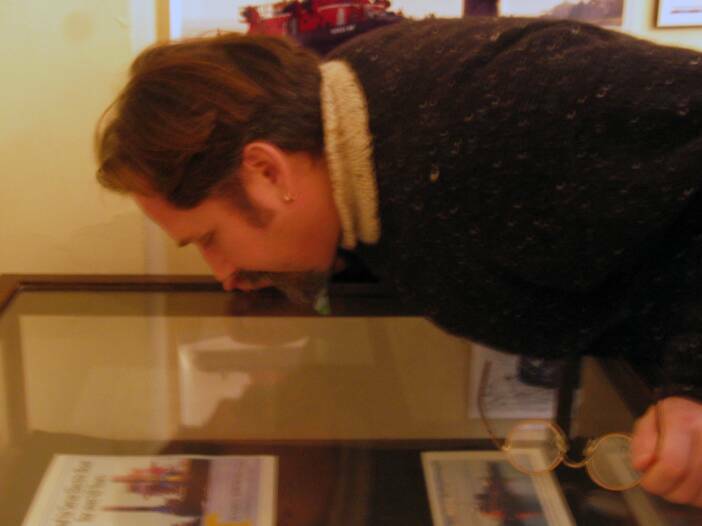 1.20.09 The 100 Years of New London Tugs exhibition continues to bring in individuals with personal ties to tugs. 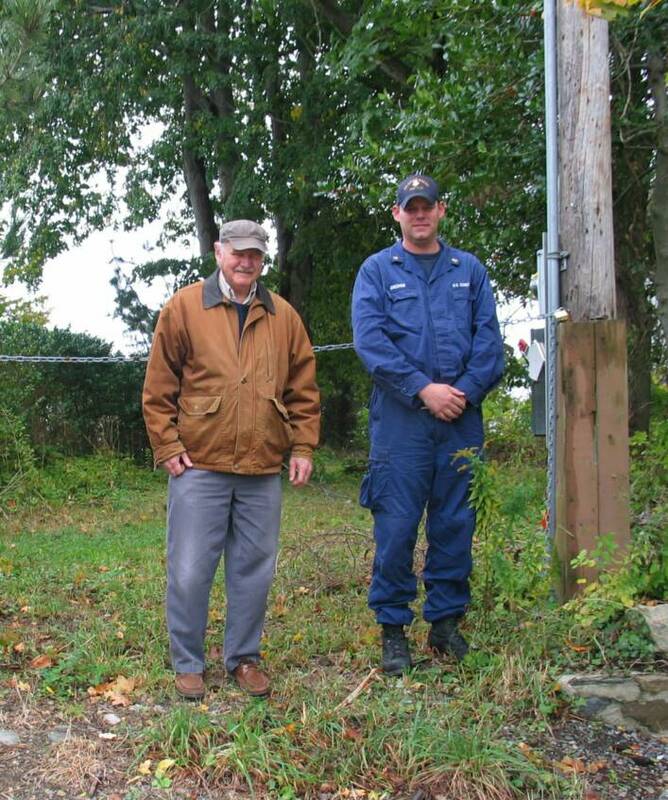 Derek Tyrseck (below left) pointed out pictures of family members and tugs named for his aunt and mother(!) 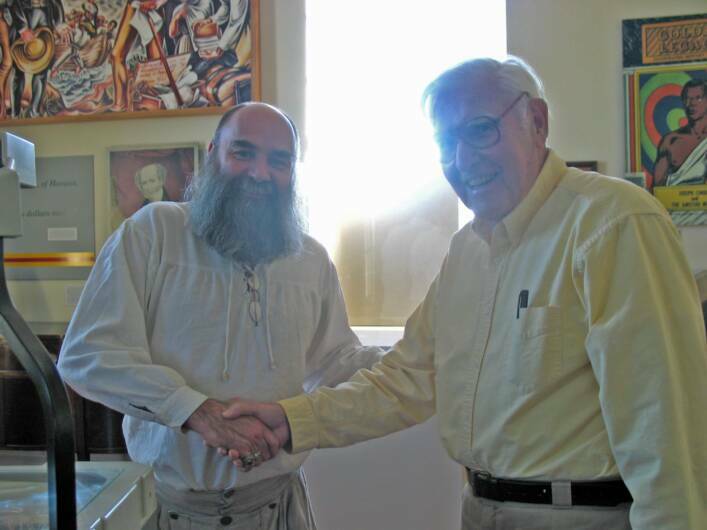 last week when he stopped by the museum with a friend. He later brought us a CD of tug photos featuring the family firm: The Thames Tow Boat Co.
Later that week, Patrick Kennedy, of Kennedy Marine, brought by photos illustrating three generations of his family and their ties with New London tugs. The photos have been added in to the exhibition broading our view of tugs in New London. We're looking forward to having both Mr. Kennedy and Mr. Tyrseck tell us about life with tugs at the next JIBBOOM Roundtable. Anyone interested in tug boats, life at sea, or the workings of our harbor should plan to be there for what promises to be a fascinating night: Thursday, February 19, from 6:30 to 8 pm. 1.9.08 Perhaps the best quality of the Custom House is that we really are your museum. Two events this week brought that point home. 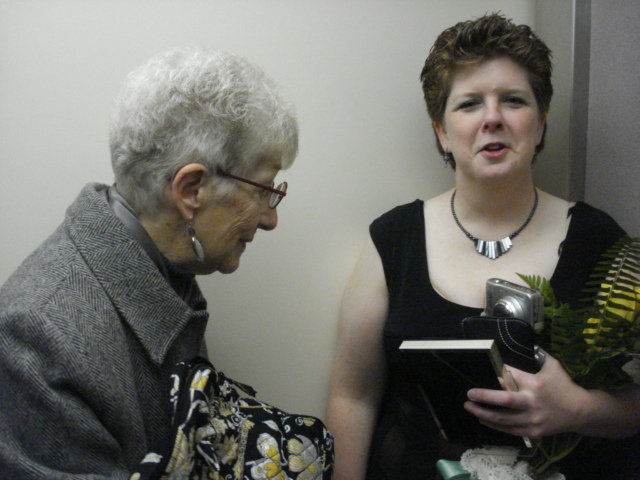 We'd met Kathy Gaynor last summer when she came to see the Two Lives of the Grandma Sue exhibition. 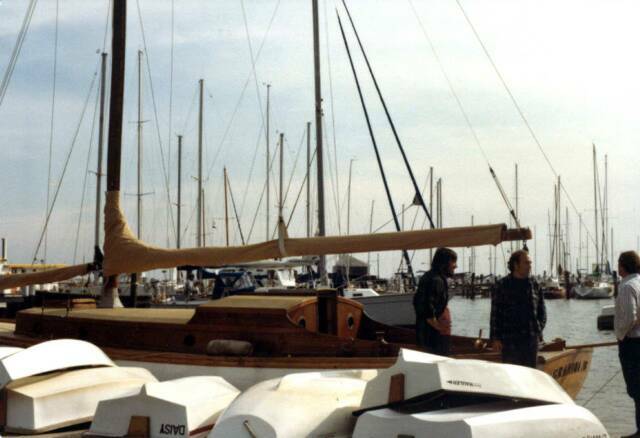 Turns out, after the sailboat left the Chester family, it was purchased by Kathy's brother, John Gaynor, and Kathy and her family had spent many hours aboard the boat. Since that visit Kathy has joined the museum as a volunteer and this week brought in photos she had come across of those happy times on the Grandma Sue. Copies of the photos, one of which you can see at the far left, will be entered in our archives. The second telling incident was a surprise visit from 93-year-old Harold Haviland, now living in West Virginia, but who had grown up in New London at #2 Star Street. 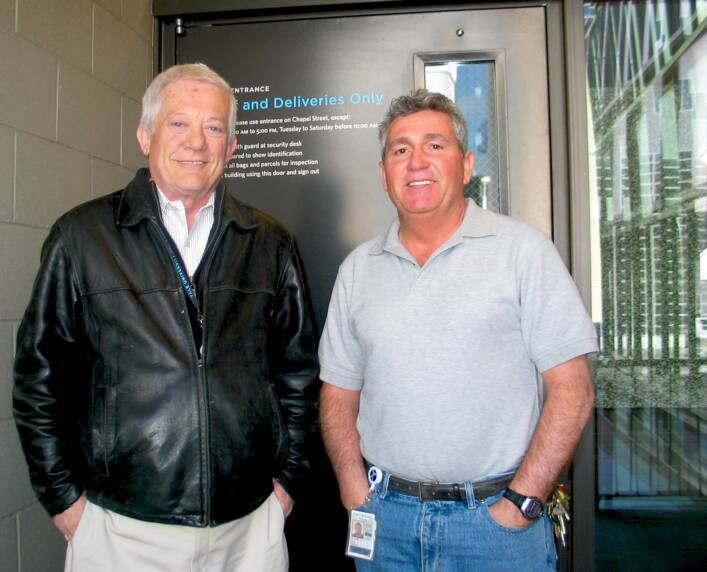 As a child, Harold delivered the newspapers. Among his customers were the agents at the Custom House. The agents never let Harold inside the building so, when he knocked on our door, we finally gave him that opportunity! 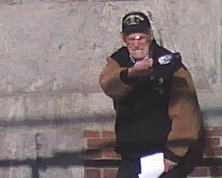 In exchange, Harold shared--and acted out--stories of prohibition days, when bottles of confiscated alcohol were smashed against the Custom House wall--to the dismay of some observers but to the delight of a gaggle of local kids--Harold among them. 1.5.09 We're warm! We're friendly! We're free! And-beginning this week-for the very first time-we're open year-round with new Winter Hours! 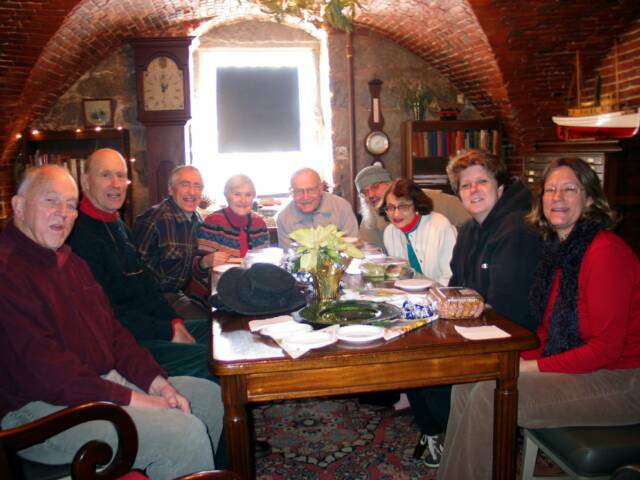 January through March you may visit the Custom House on Thursdays, Fridays & Saturdays from 1 to 5 pm, weather permitting. Of course, we also still are open by appointment. 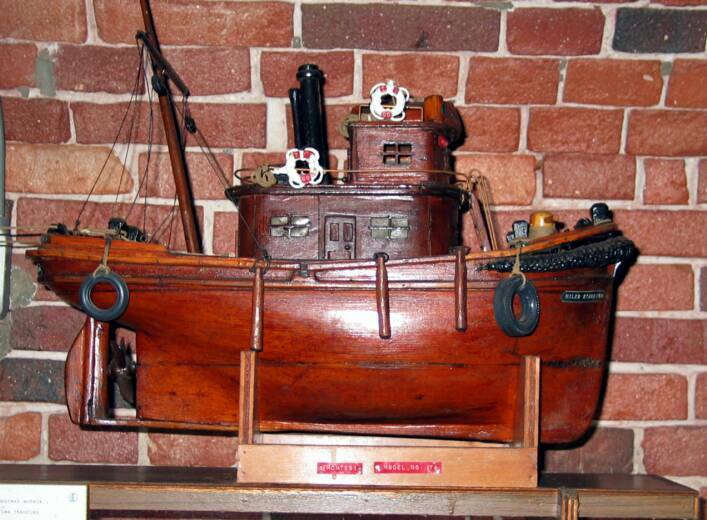 Please call the museum at 860-447-2501 to make arrangements to visit off-hours to see our special Little Toot and Tugboat exhibitions, or to take the extended architecture tour with head docent Bill LaRoue. 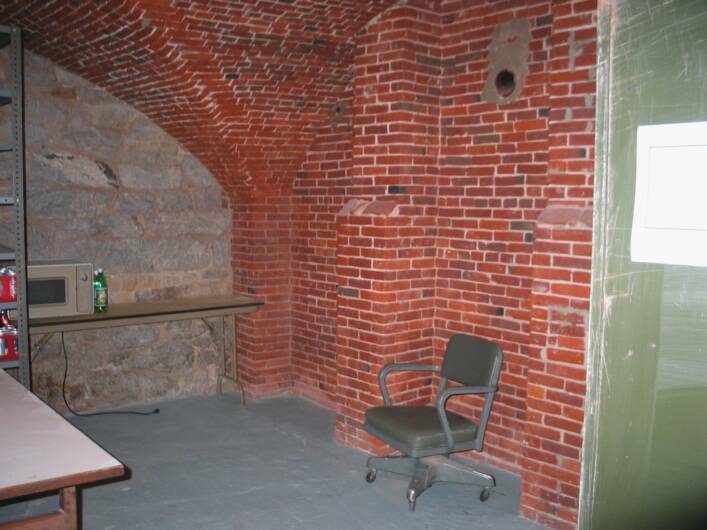 (There is a $5 charge per person for the architectural tour, which takes about 90 minutes and leads you from our sub-basement to the attic). 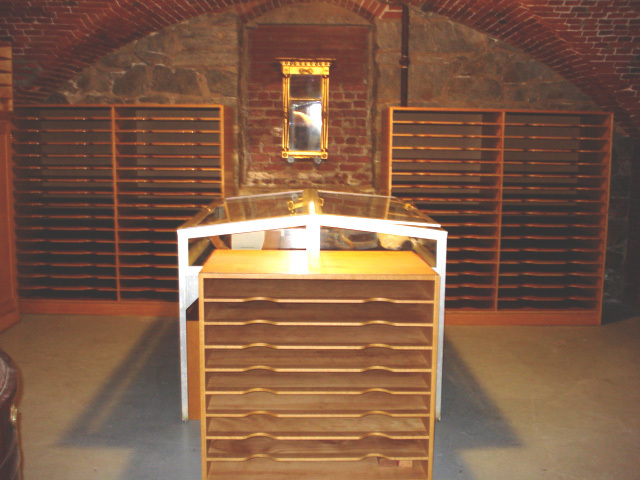 Cases at YUAG in New Haven. 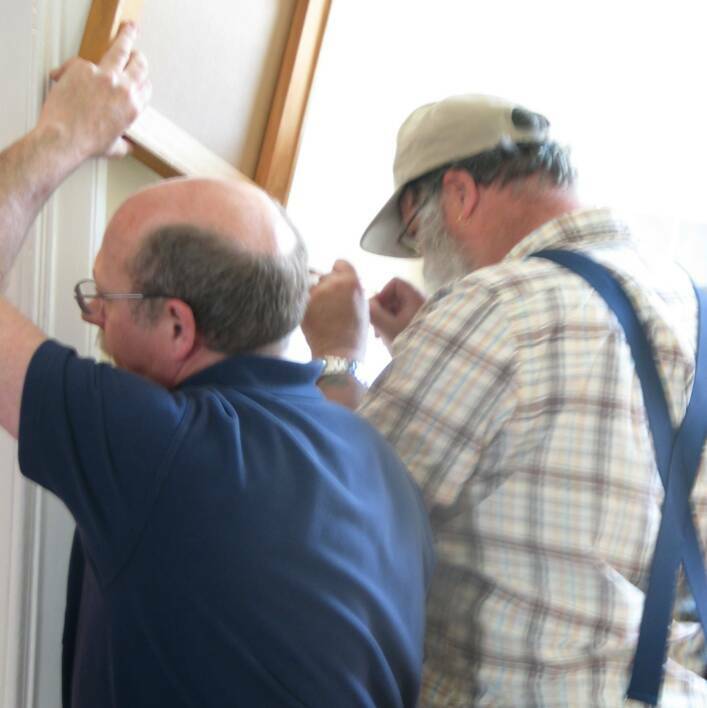 Dylan, Al & Matt removing a door. Yale's Robert Moore & Joe Branco. 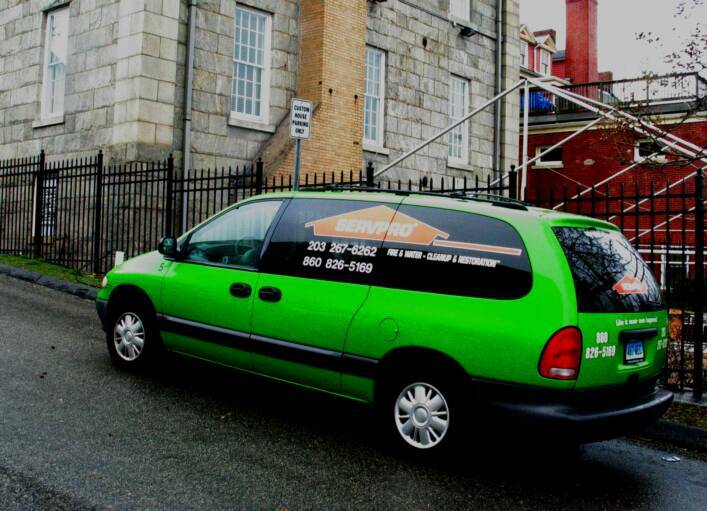 ServPro at the Custom House. 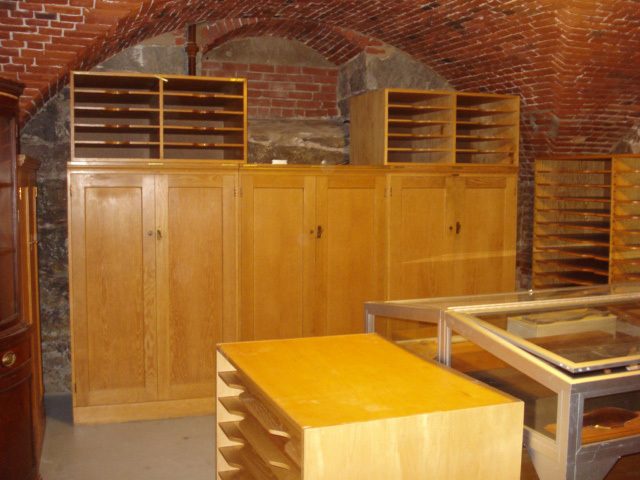 The new Collections storage room.